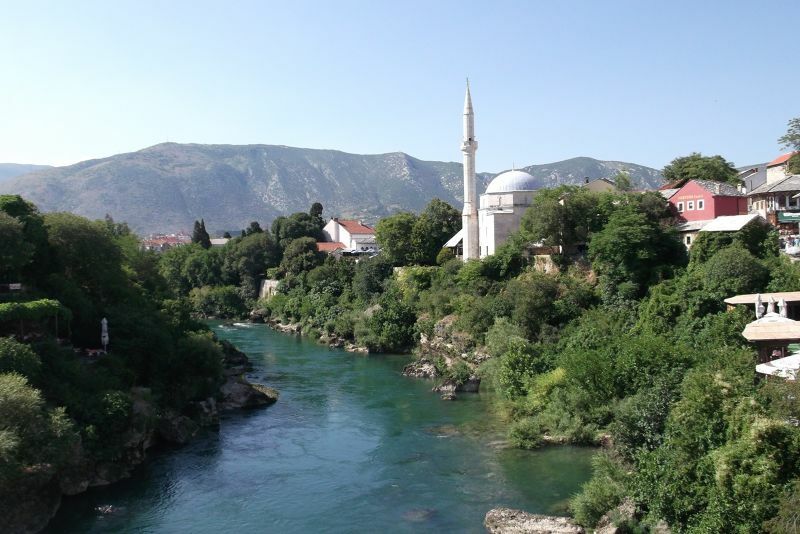 Bosnia And Herzegovina - Trips to the Balkans. City of the Bridge Keepers. 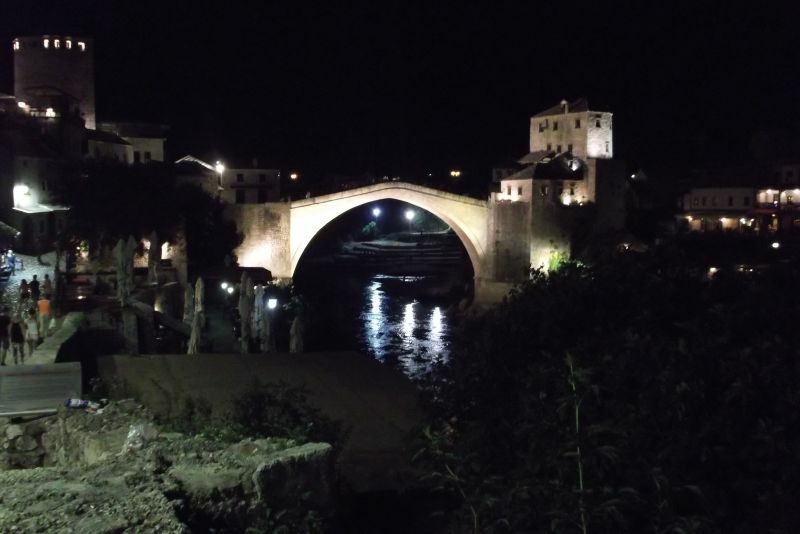 The Stari Most - Old Bridge. 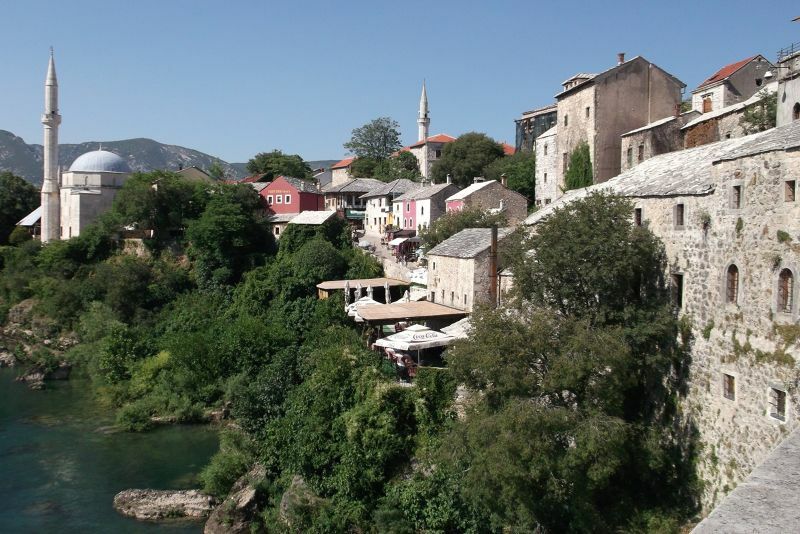 We travelled to Mostar by bus from Sarajevo. 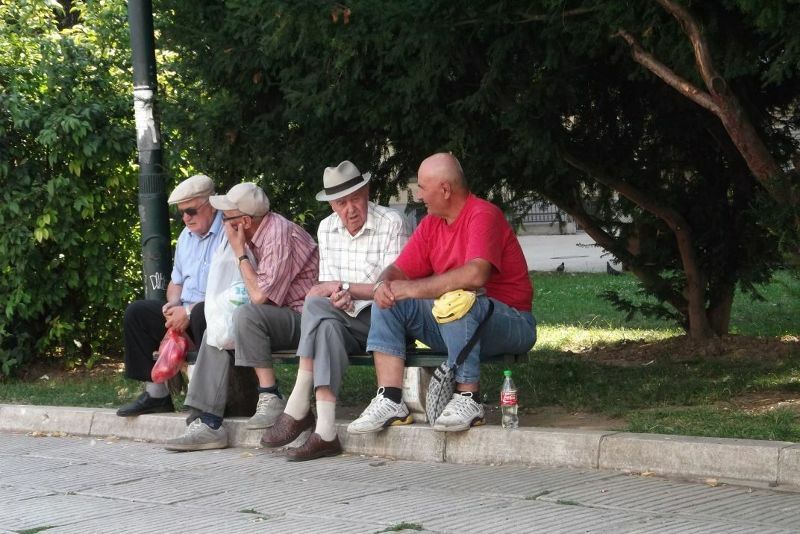 One of the guys in our pension in Sarajevo told us Mostar was the hottest place in Bosnia Herzegovina. It certainly felt like it on the walk to our accommodation. It was around 3pm and the stones of the roads and buildings seemed to be giving out heat. It was not a long walk but we arrived overheated and exhausted. 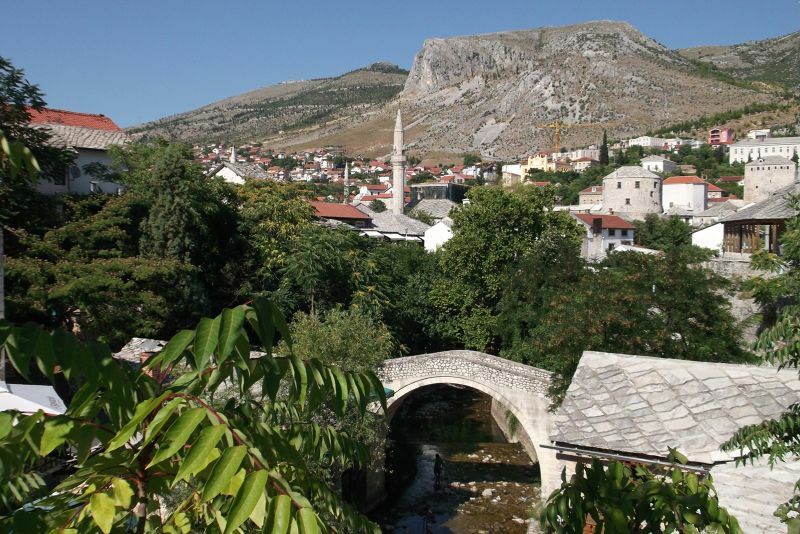 When we had cooled down and recovered a bit, we set out to explore Mostar. On our walk along Marsala Tita from the bus station to our accommodation we had passed many, many bombed and burnt out buildings. When we reached the area with the old bridge, everything was pristine and repaired. I actually found the contrast really disturbing. It was like wandering through Hell and suddenly arriving in Fairyland. 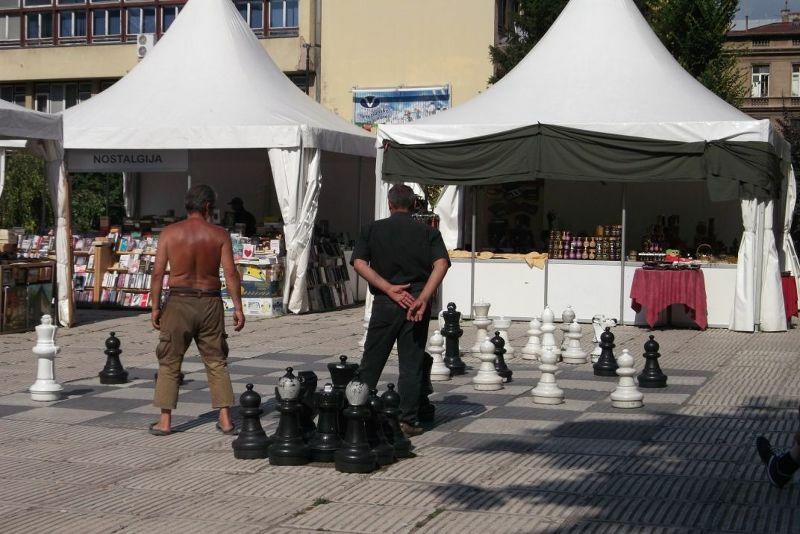 Mostar was a confusing place. We had been given a map of Mostar at our accommodation with 13 sights marked on it. 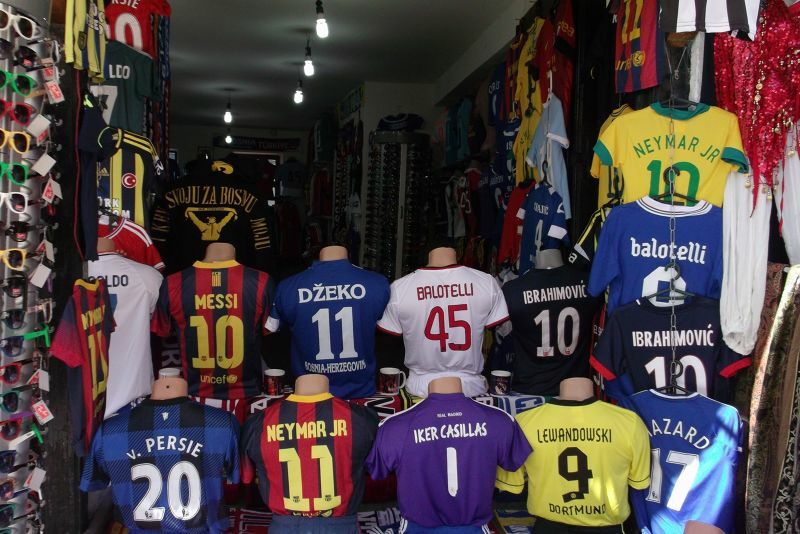 We decided to wander round trying to see all of these. They were quite widely dispersed. 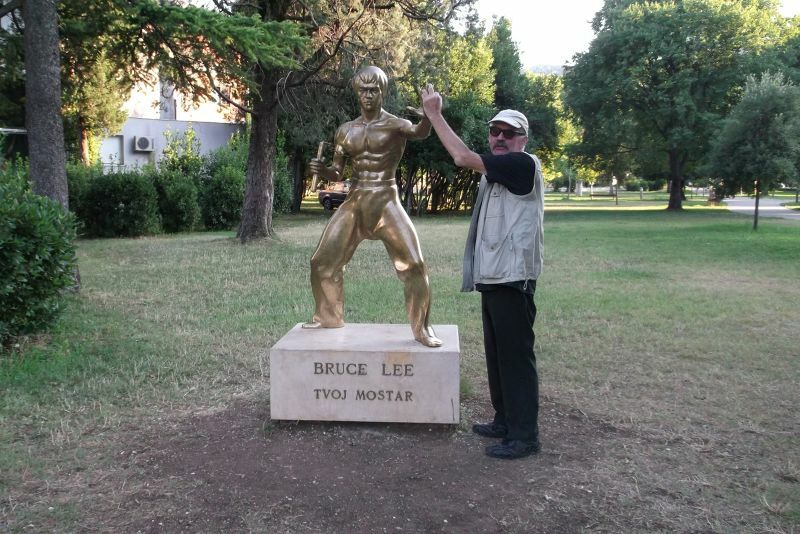 I actually only began to like Mostar when we wandered into a park, not one of our sights, and found a Bruce Lee statue in it. 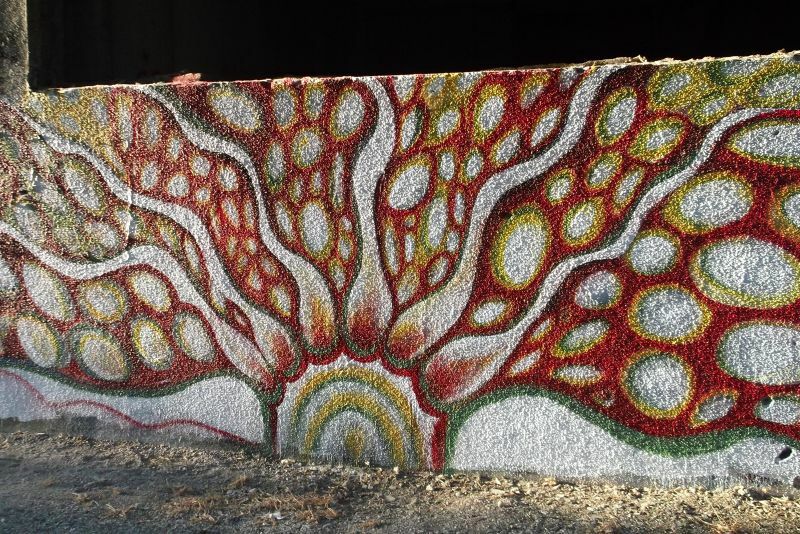 The feeling of disorientation began to leave me and I began to enjoy the beauty of the town. 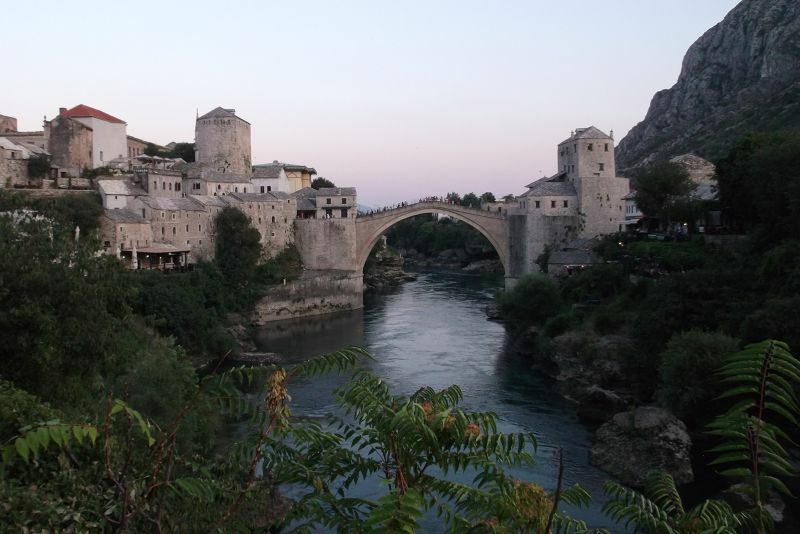 Stari Most - The Old Bridge. This beautiful bridge gives the town its name. It must have been absolutely devastating when it was destroyed in the war. 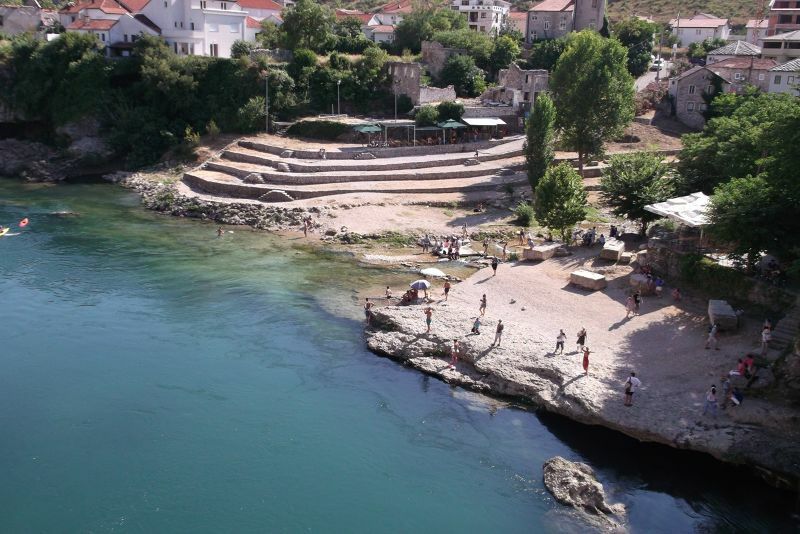 Mostar suffered so much, but this must have felt like having its heart ripped out. The bridge is now beautifully restored and in tip-top condition. It's very steep and very slippy and difficult to walk on. 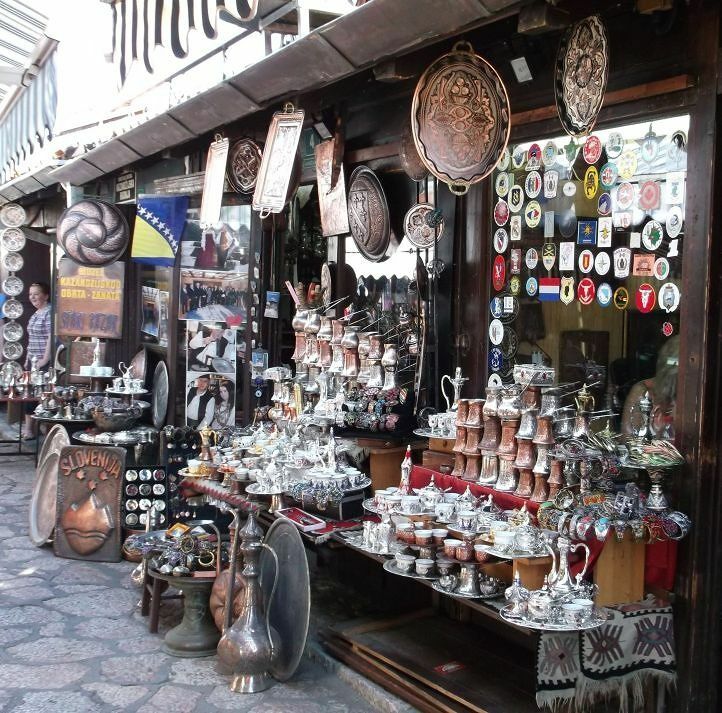 On both sides of the bridge there are old Turkish areas filled with beautiful craft shops. From the bridge there are spectacular views over town. 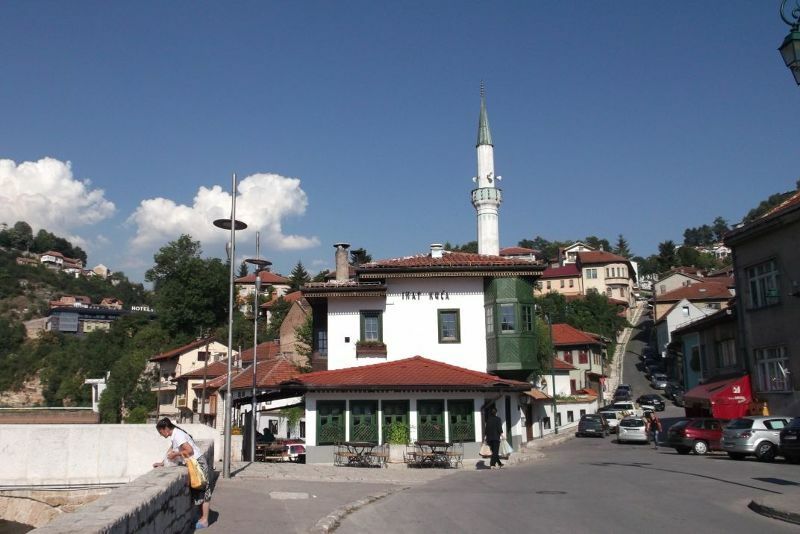 There is a very good view of the bridge from the Old Turkish Area and also from the garden of Koski Mehmed Pasha's Mosque. I wandered into the grounds of this mosque and took lots of pictures of the view around 7pm on our first evening. We returned next day to find you had to pay an entrance fee to get to this viewing point. I think they only charge this while all the day-trippers are in town. 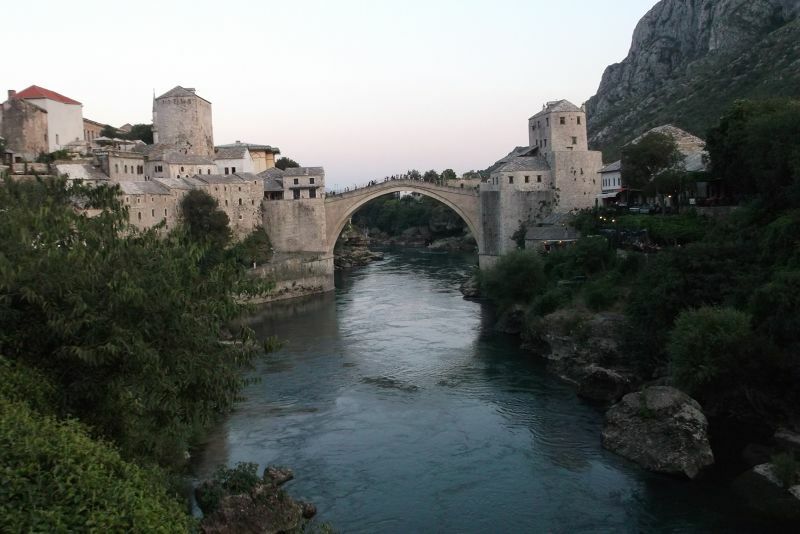 The bridge was originally built across the Neretva River in 1556. It took 9 years to build. It was totally destroyed by bombs in 1993 and has now been completely restored. A diving competition takes place here each year. There are wonderful views from the old bridge. On one side you look over a mosque and the Old Turkish part of town. On the other side you look towards another bridge and over an area where people swim in the river. I would have loved to go for swim in there, too, but time was against us. Spectacular. Kujundziluk - Old Turkish Area. This area is around the old bridge. Most of it has been beautifully restored. 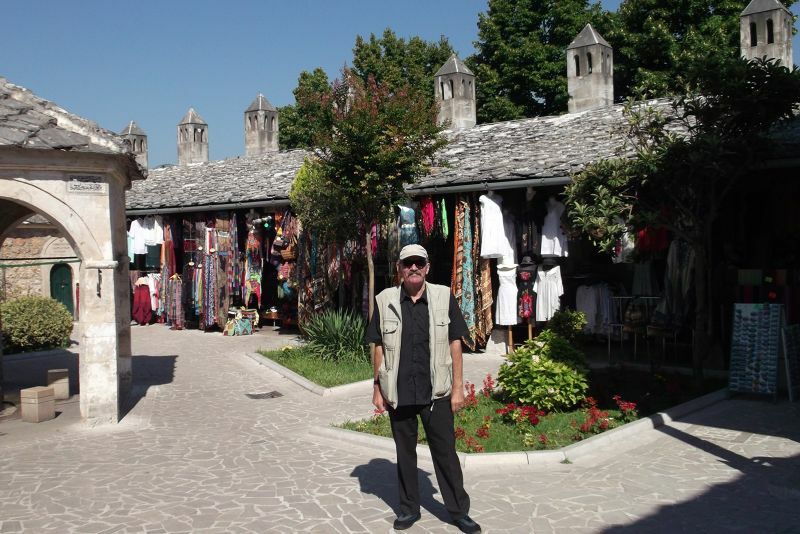 It has wonderful craft shops and restaurants and is a really pretty area for a stroll. The Crooked Bridge - Kriva Cuprija. This lovely bridge is near the Old Bridge. It has a similar style but is much smaller. 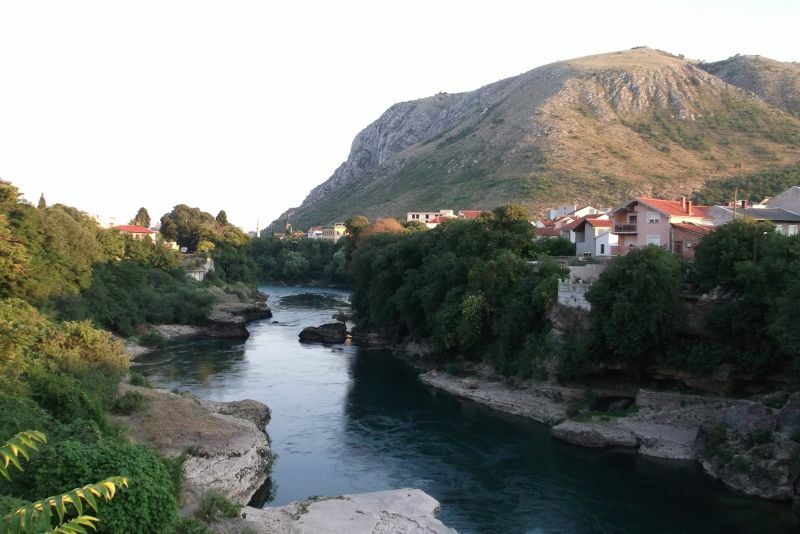 It is located in a lovely setting and spans a branch of the Radobolja River. We were on a mission to see all the sights marked on our map and this was one of them. It had such a tall tower we could never fit it in in a shot unless we were really far from it. It was peaceful inside and I loved their dress code sign on the door. Please tell me no-one would consider going to church like that. 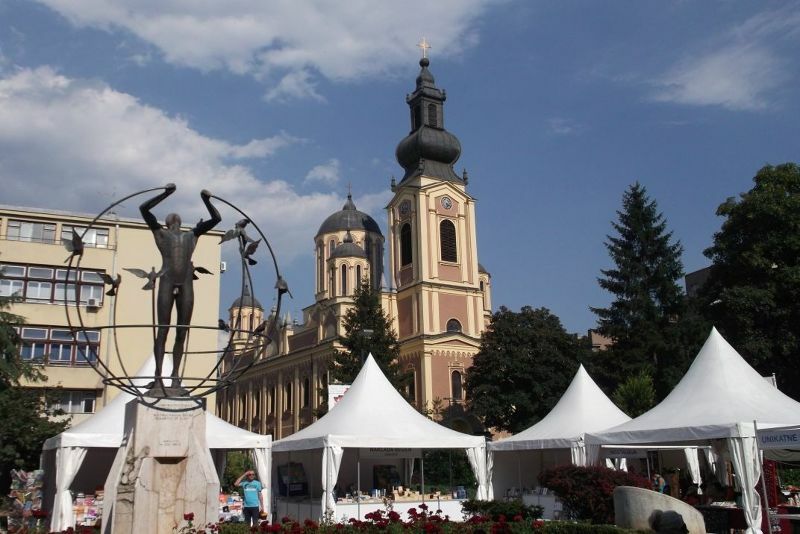 The Franciscan Monastery is also known as the Catholic Church. You can see its steeple all over town. 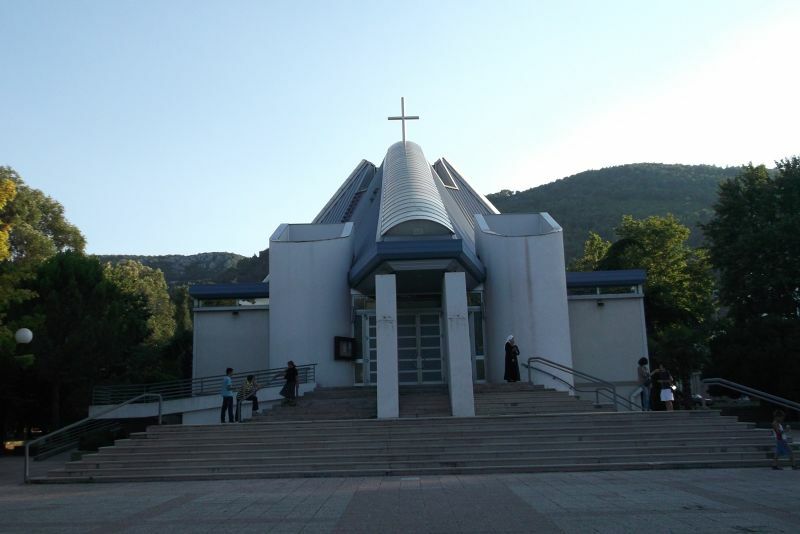 The Franciscan Monastery is located on Franjevacka near Bulevar. 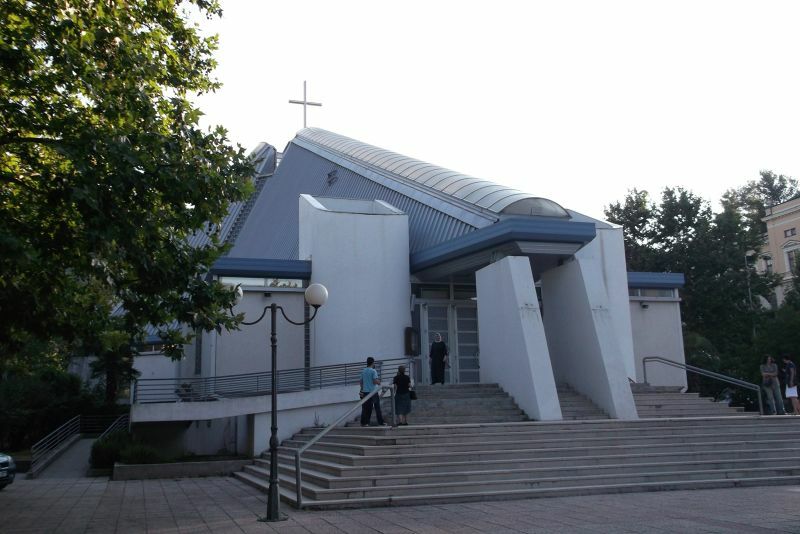 Cultural Centre Herceg Stjepan Kosaca. This was marked on our map so we had a look. There were some statues outside and a little cafe where we stopped for a cool refreshing drink. 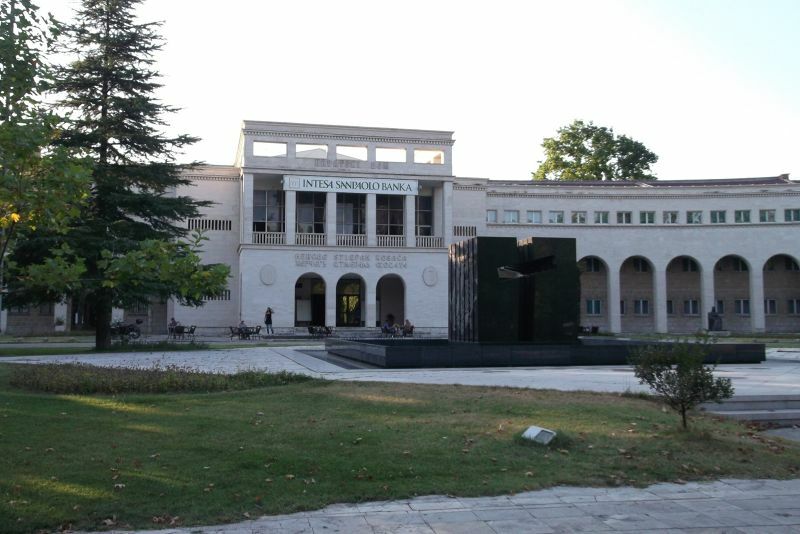 They hold exhibitions here. We enjoyed the refreshments in the cafe. The Bishop's Residence And Catholic Cathedral. The Bishop's Residence was on our map as a sight, so we went to have a look. It was quite a nice building but more interesting was the futuristic looking Catholic Cathedral across the road from it which was not even marked on our map. The Bishop's Residence dates from 1906. 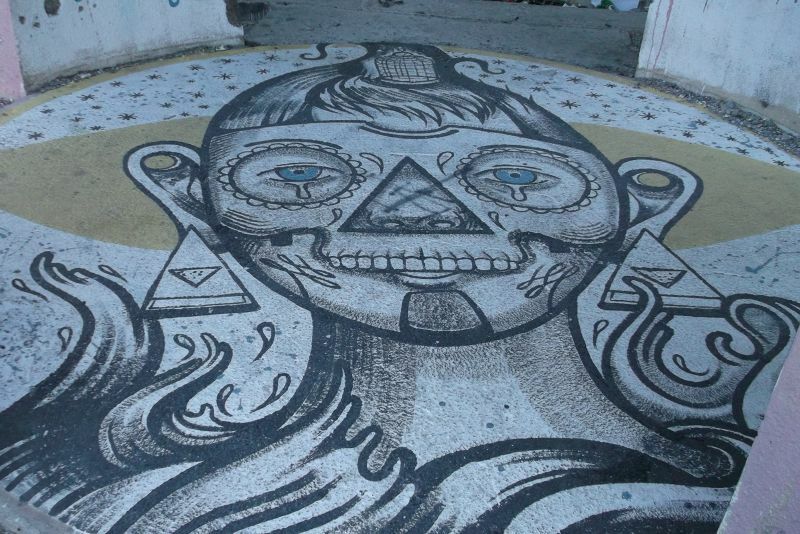 These are located on Biskupa Cule. 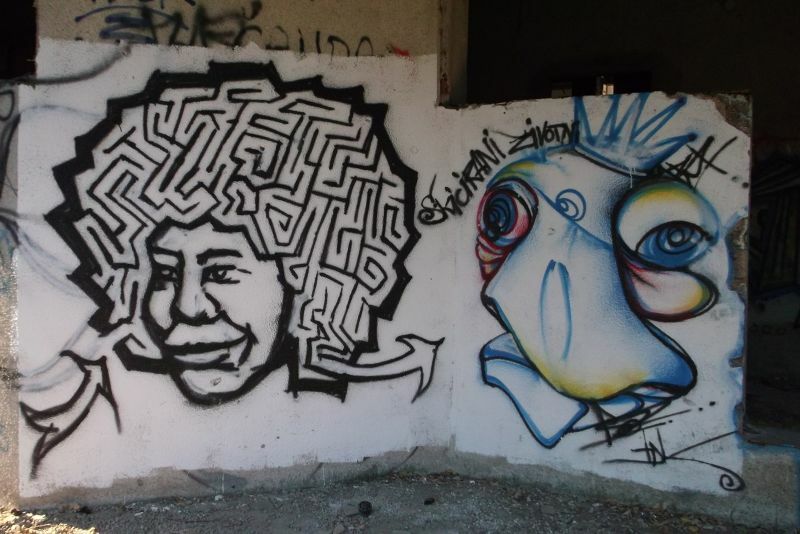 Back near the cultural centre there was a pleasant park located between Nikole Subica Srinjskog and Kralja Tvrtka. This was not marked on our map as a sight but it was pleasant for a stroll or a seat. 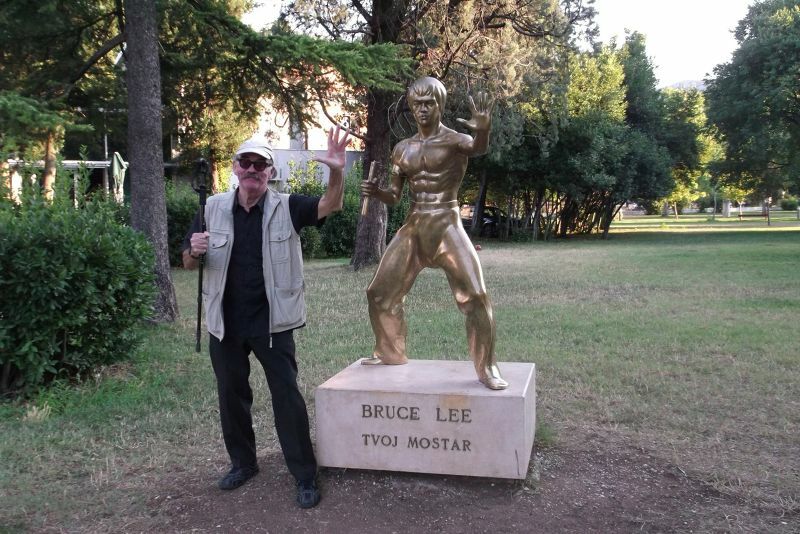 Then right in the middle of it we found a statue of Bruce Lee. We were pleasantly surprised by this since we live in Hong Kong and used to live next door to an actress who was his former girlfriend. 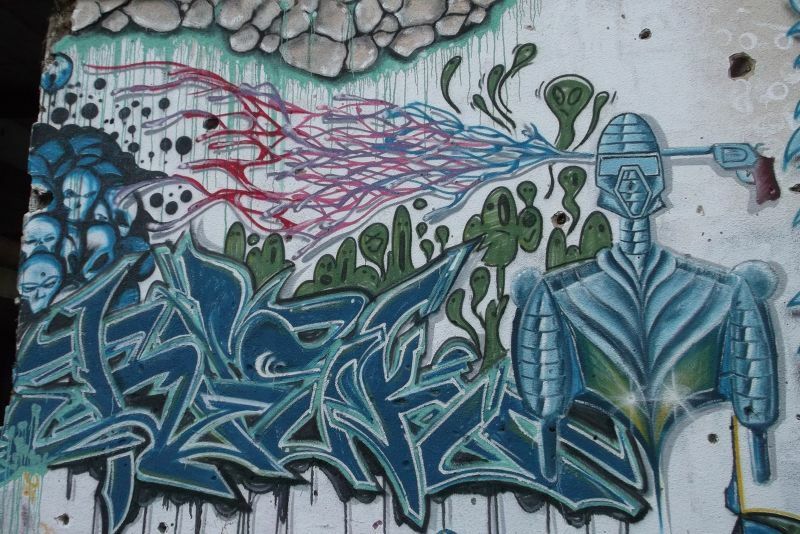 The other thing we liked about the park was near one exit it had been very creatively graffittied and this continued in a bombed out building just across the street. 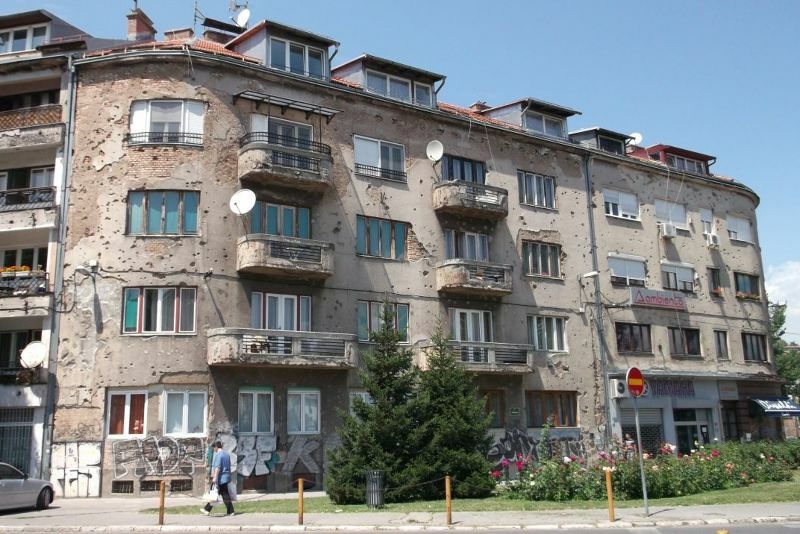 Bombed Out Building On Kralja Zvonimira. 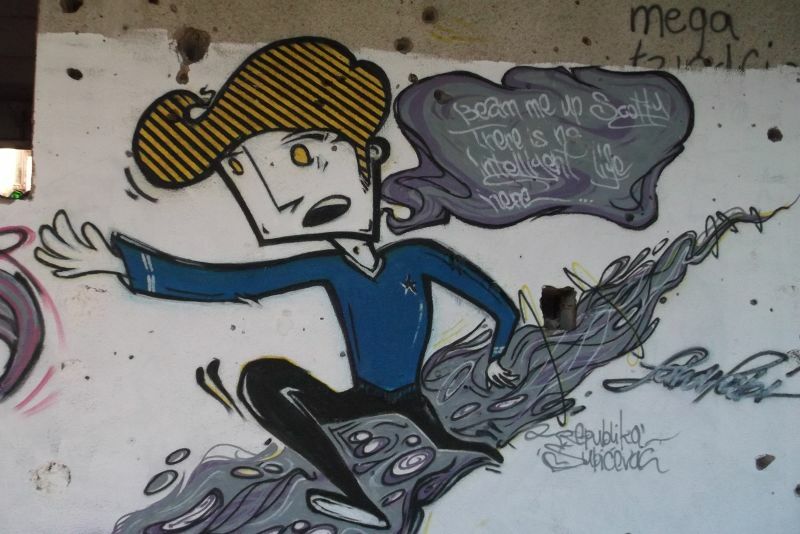 Near the exit to the park there was a bombed out building filled with discarded bottles and rubbish but covered with really beautiful graffiti. We had a look but did not venture inside as it is dangerous. 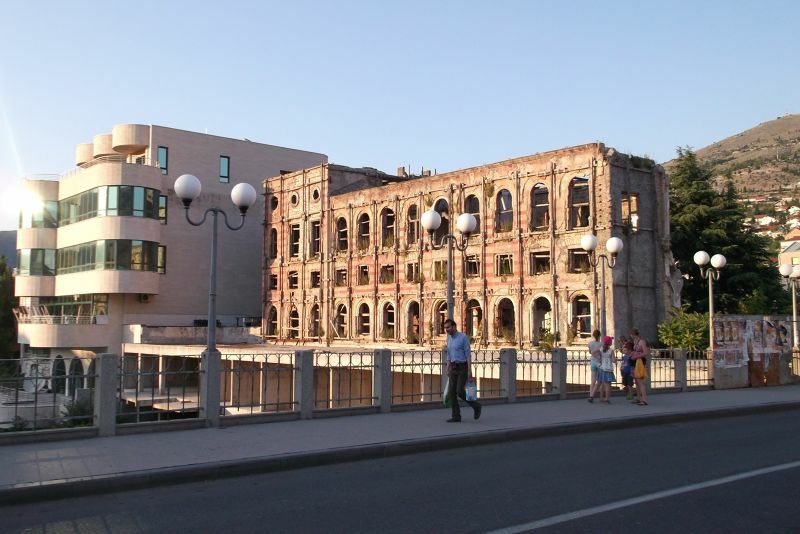 This beautiful building was surrounded by burnt out buildings. 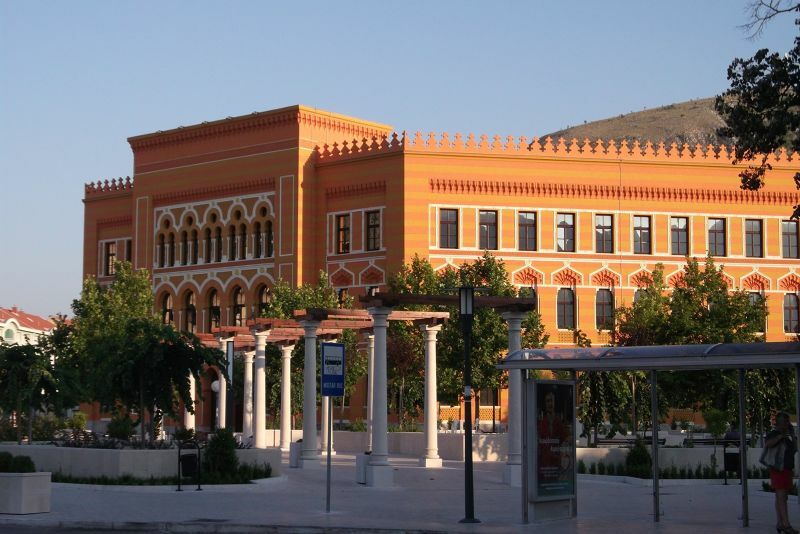 It is a grammar school in pseudo-Moorish style and dates from 1898. It was built by Franz Blasek. 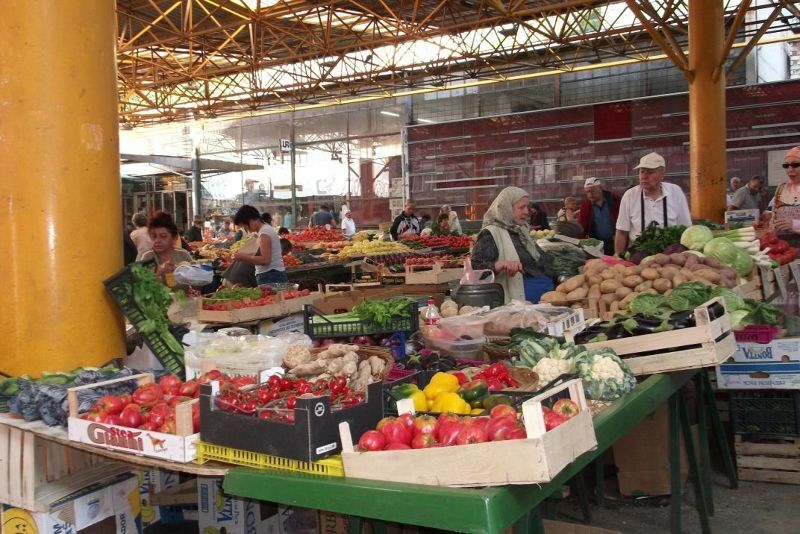 It is located at the junction of Bulevar and Kralja Zvonimira. From here we continued down Mostarskog Bataljona to the Bristol Hotel and a bridge with good views over the river. 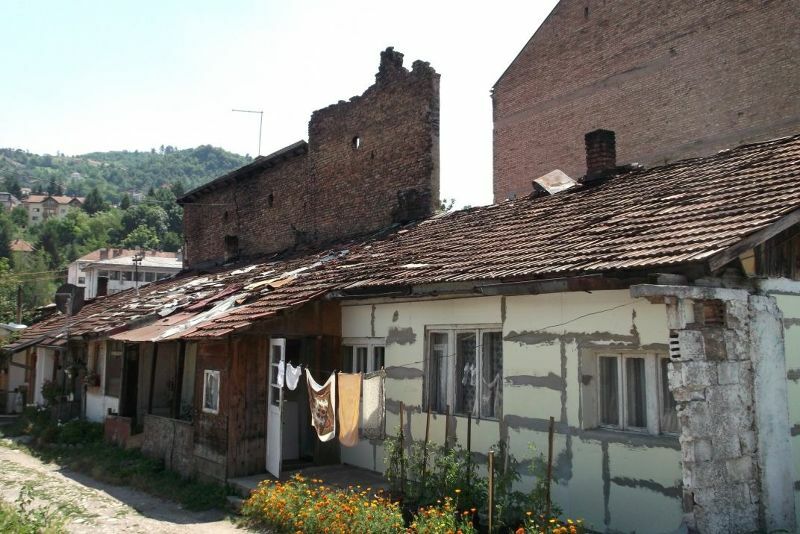 This house was built in 1635. 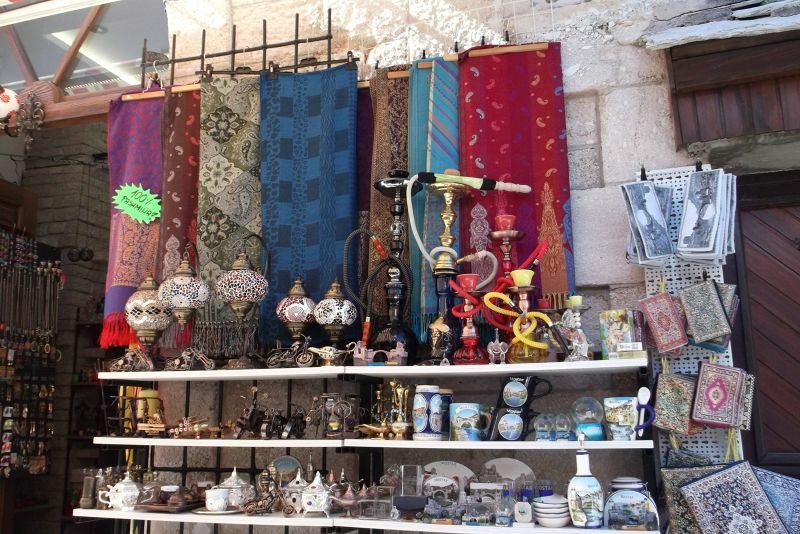 It dates from Ottoman times. 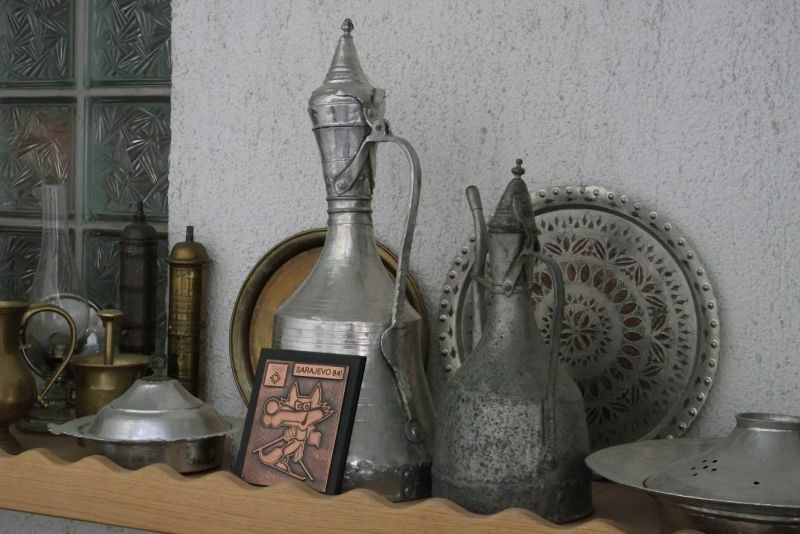 Nowadays it houses a private ethnography collection. 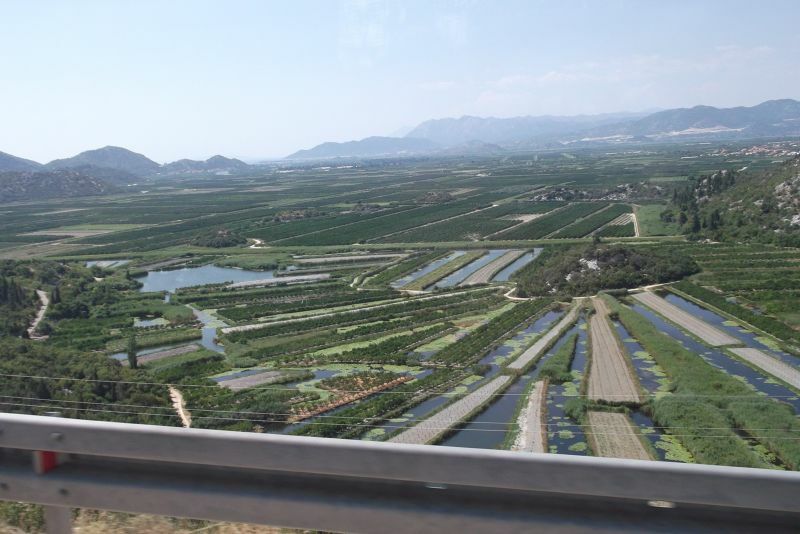 It was closed when we visited but we looked at the famous bit that juts out over the Neretva River supported by tall columns. This mosque has some stalls in its grounds. There are great views of the Old Bridge from the gardens here. Apparently you can also climb up the minaret for views - though we did not. 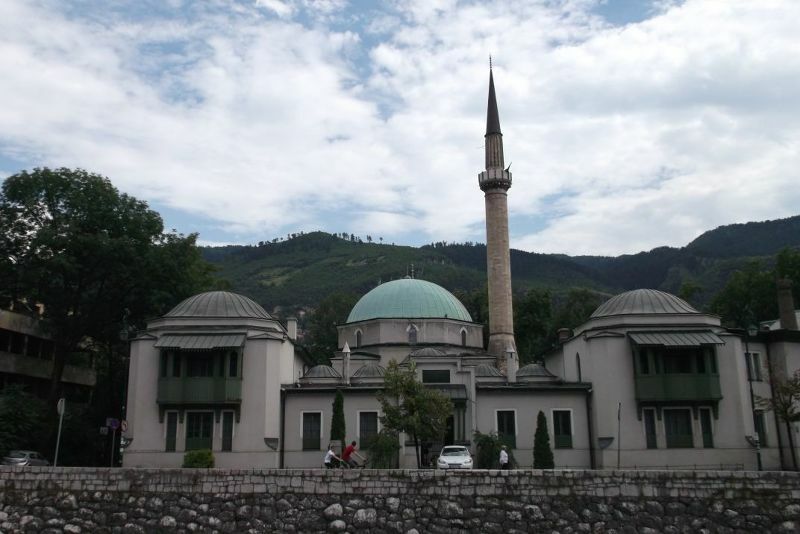 This mosque was built in 1617. 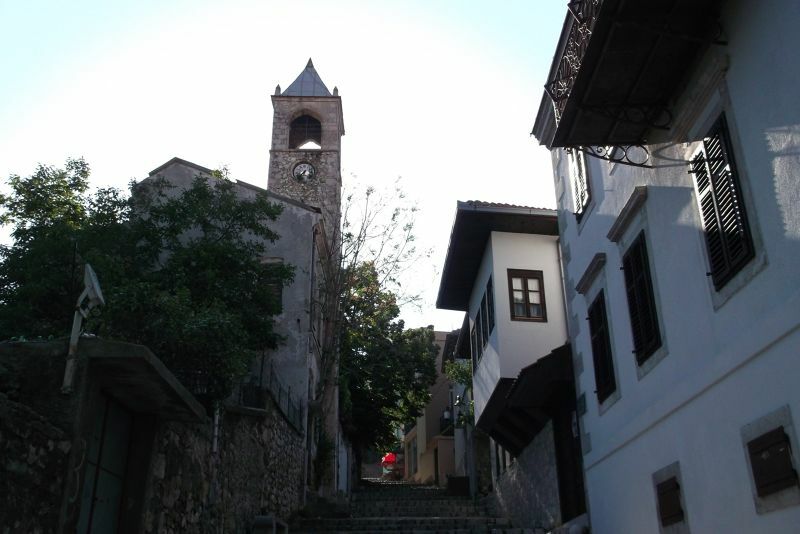 The old clock tower is located on Bajatova. It is known to predate 1636, but its ts exact date is unknown. It's near a lovely mosque that I do not know the name of. Worth a look if you are in the area. 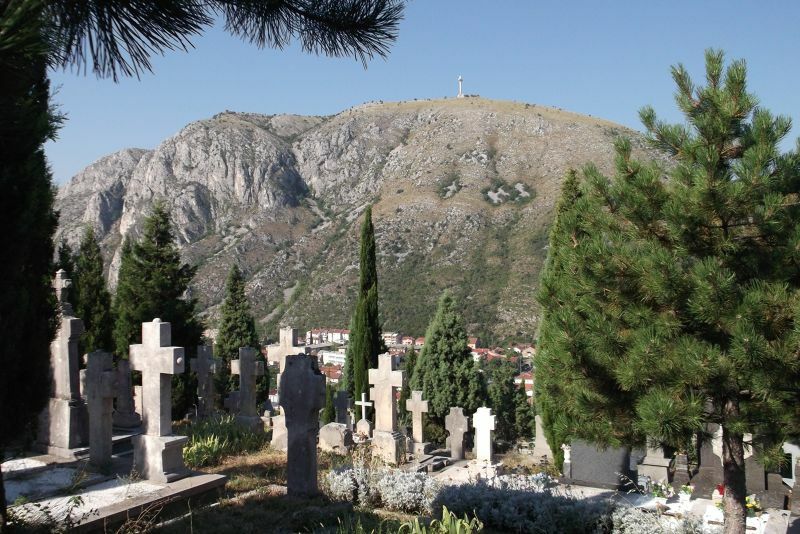 We were looking for the Old Orthodox Church and went the wrong way and ended up in this stunning Christian cemetery with spectacular views over Mostar. The cemetery was well-kept, colourful and very peaceful. This was hard to find and when we eventually found it it was closed. We headed up the hill past the old clock tower, passed under a motorway and then should have climbed some stairs behind a fence next to some bombed out buildings. 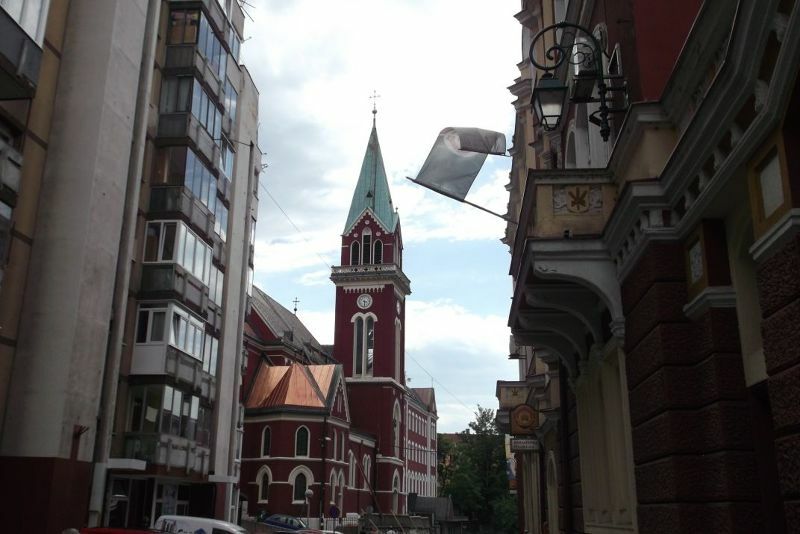 The church is behind the bombed buildings. We only found it because we could see it from the cemetery I just wrote about. 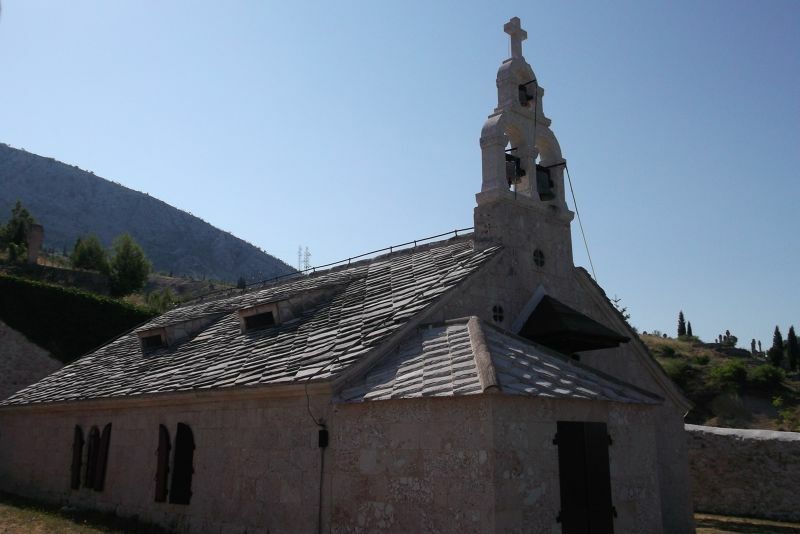 The church dates from 1833 and is supposed to contain wonderful icons. 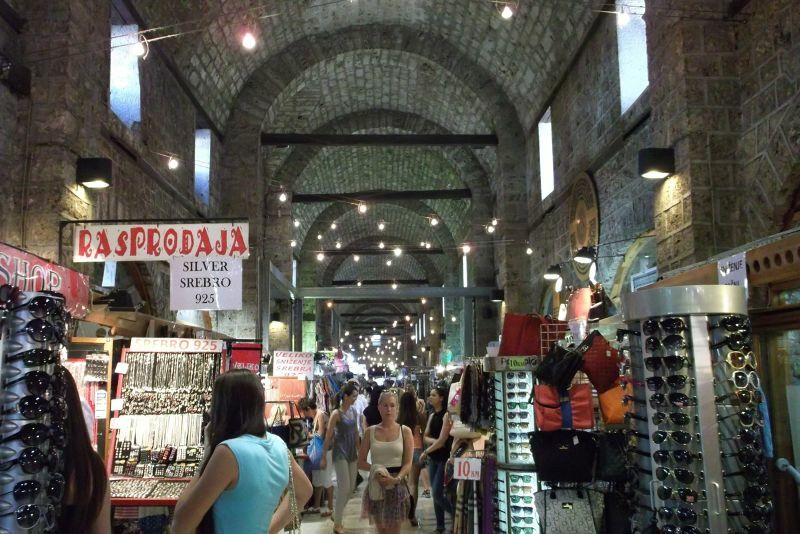 We were delighted to find Mostar absolutely full of supermarkets and little bakeries excellent for snacks and cold drinks. After our long long day of sightseeing in the burning sun, we were too exhausted to eat out plus we wanted to be in the dark and cool. Since we had our own living-room/kitchen/dining-room the supermarket was the best place to purchase all we needed for a pleasant night in. 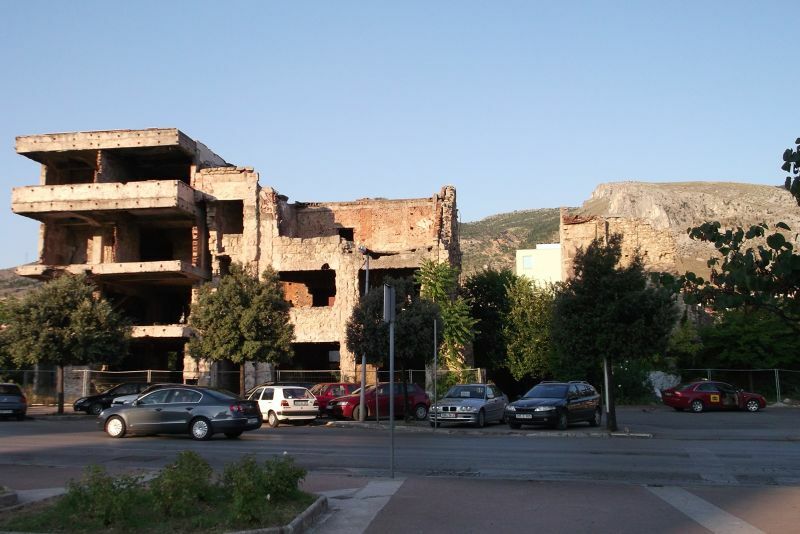 Sadly you will see bombed out buildings all over Mostar. You must not go inside any as they are dangerous. There may be unexploded devices inside. Parts of the building may be unstable and could fall down. 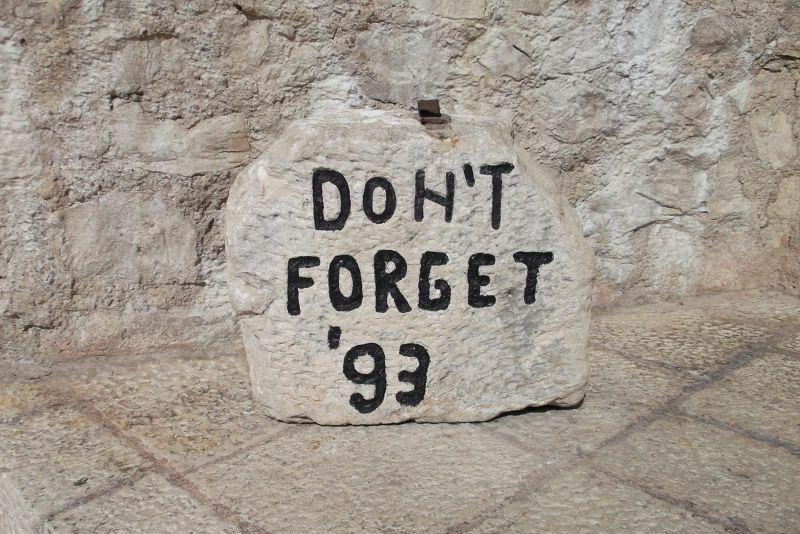 They are a poignant reminder of the horrors that took place here. 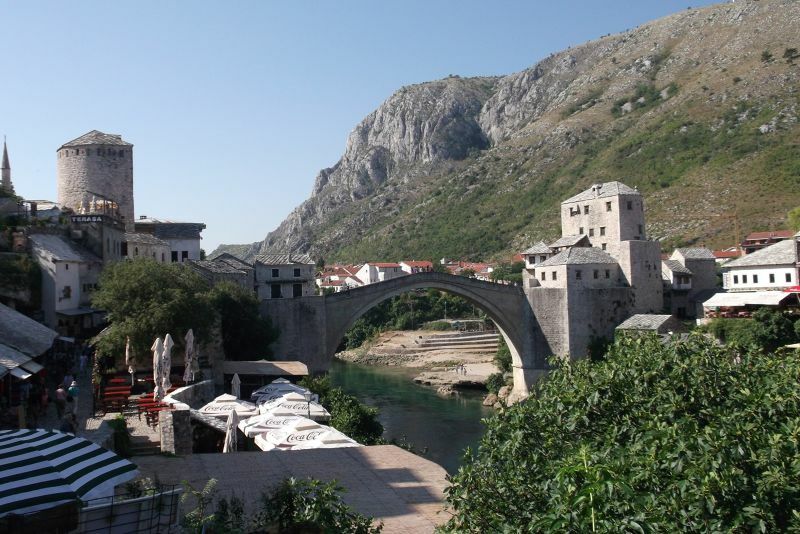 We booked a bus from Mostar to Dubrovnik.It is quite a frequent service. Please note you must pay 1 Euro or 1 KM per item of luggage you put in the boot of a Bosnian bus. The bus was comfortable and air-conditioned. It did, however, take a long time to go through customs/passport control. 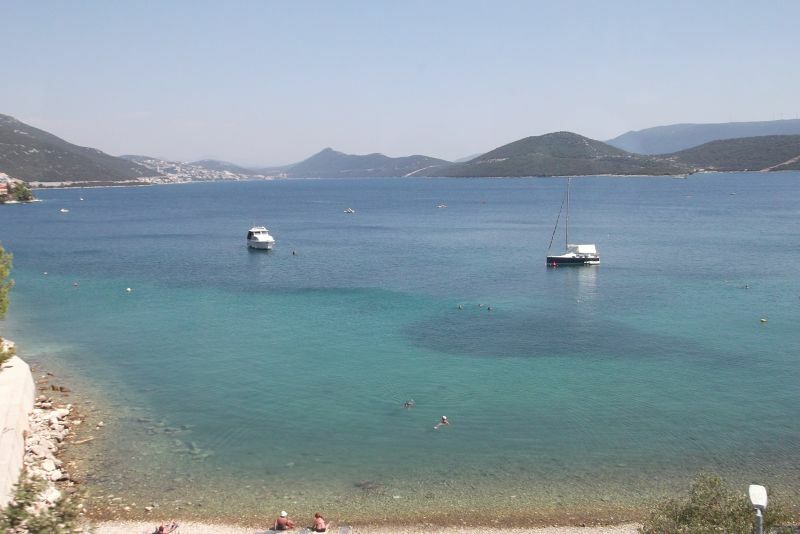 On route you exit Bosnia, enter Croatia; then when you hit Neum exit Croatia and re-enter Bosnia. 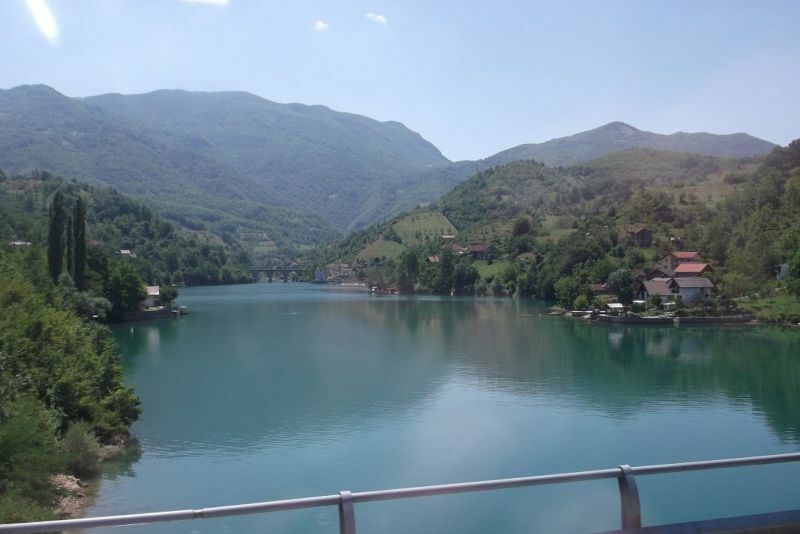 Then after Neum exit Bosnia and re-enter Croatia. Passports are checked each time. The scenery especially the coastal scenery was lovely. The bus cost 32 KM (16 Euros). It took 4 hours due to delays at customs. A Beautiful and Friendly Place. 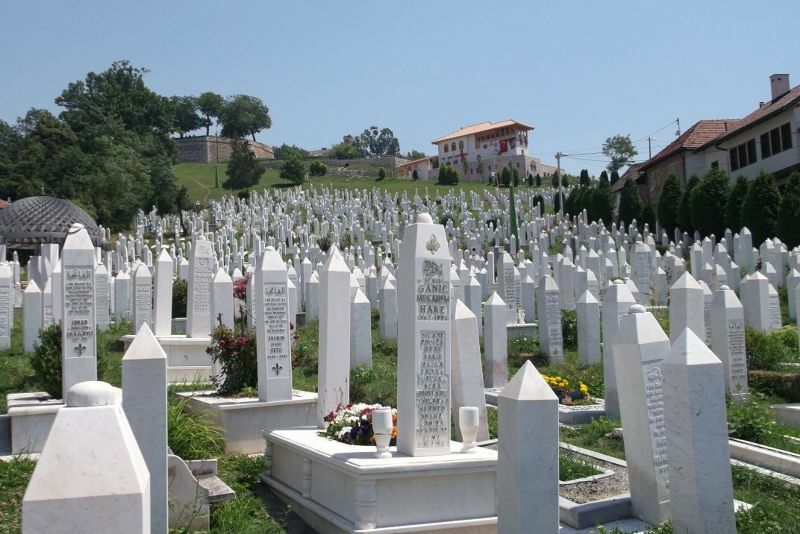 We first visited Yugoslavia, when it still was Yugoslavia, in 1987 and again in 1988. 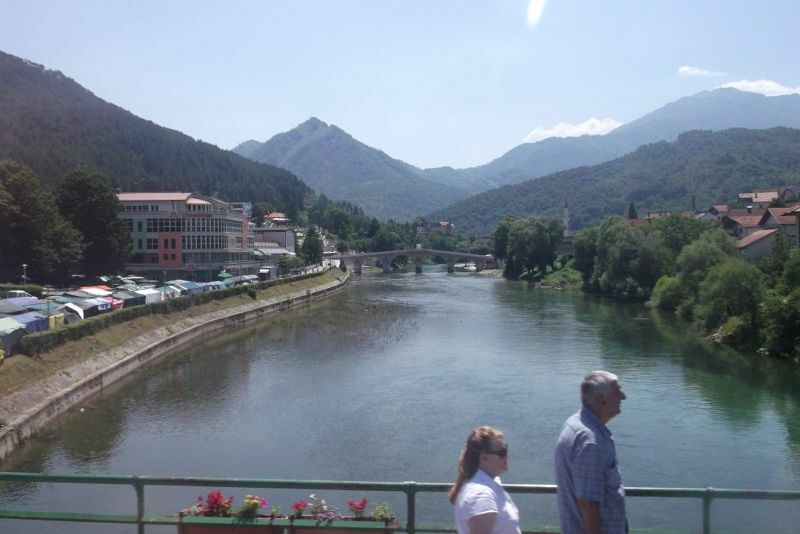 At that time I was still at university and my husband was working in Istanbul and we were both working in Austria for the summer, so we travelled by train from Istanbul through Northern Greece and through Yugoslavia all the way to Austria. 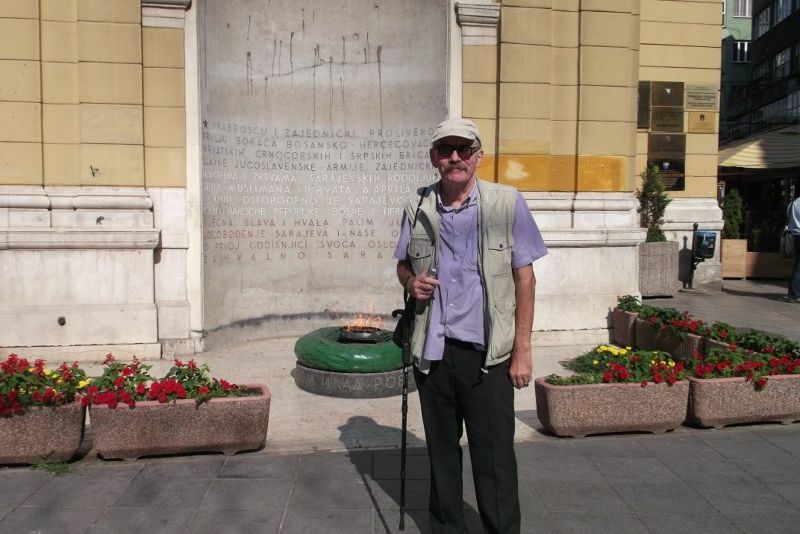 In Yugoslavia we stopped in Belgrade twice and in Ljubljana once. 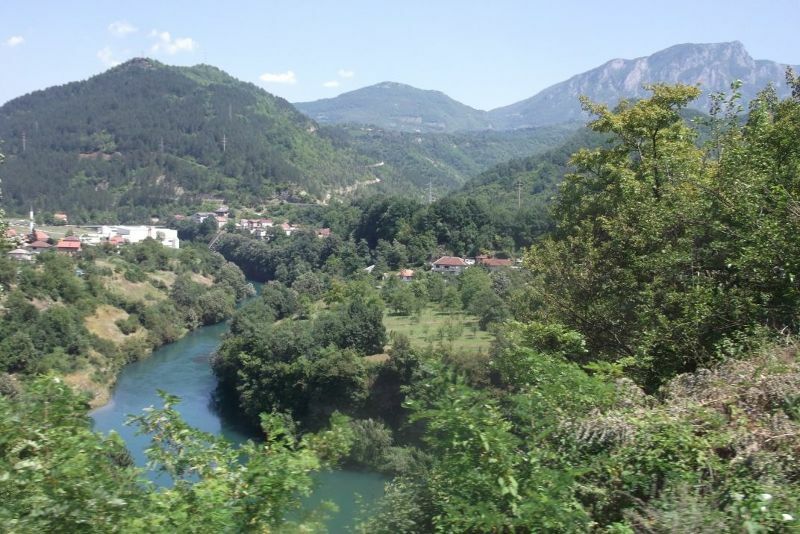 I know our train passed through Skopje so I know we went via Macedonia, but I don't think we passed through Bosnia. The train journey was extremely crowded, hot and uncomfortable, but we were impressed by the fact that all the people who shared our train compartment talked to each other and shared food with each other and helped each other with luggage. It was impossible to take luggage off due to the crowds, so it was passed out the window. I remember commenting how great it was that all these people from different ethnic backgrounds got on so well. That was of course before the war and that was of course ordinary people, not politicians. 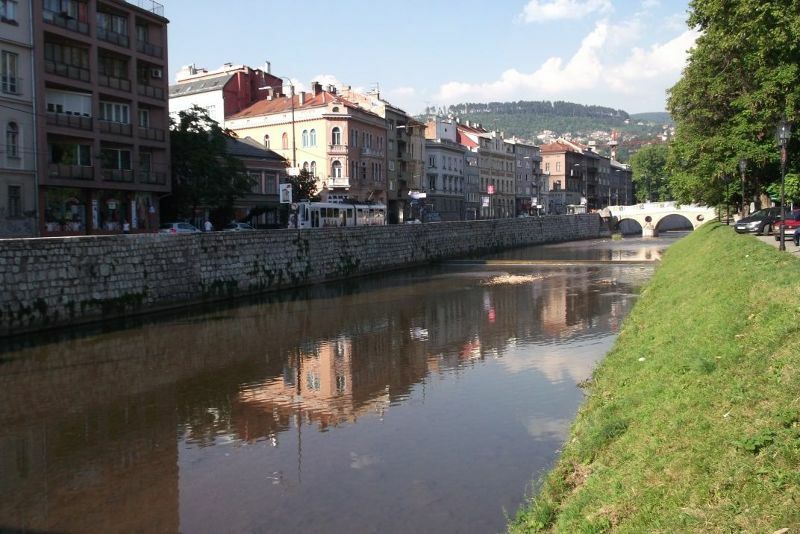 I got interested in visiting Sarajevo after reading 'The Cellist of Sarajevo'. The book apparently upset the real cellist because it used him in a fictionalized story without his permission. However, the book's descriptions of the hardships involved in everyday activities such as crossing the street or collecting water deeply moved me. Also the description of the library burning and the ashes of all the irreplaceable books raining down on the people touched something inside me, too. It sounded such a sad but lovely place and I wanted to see it for myself. 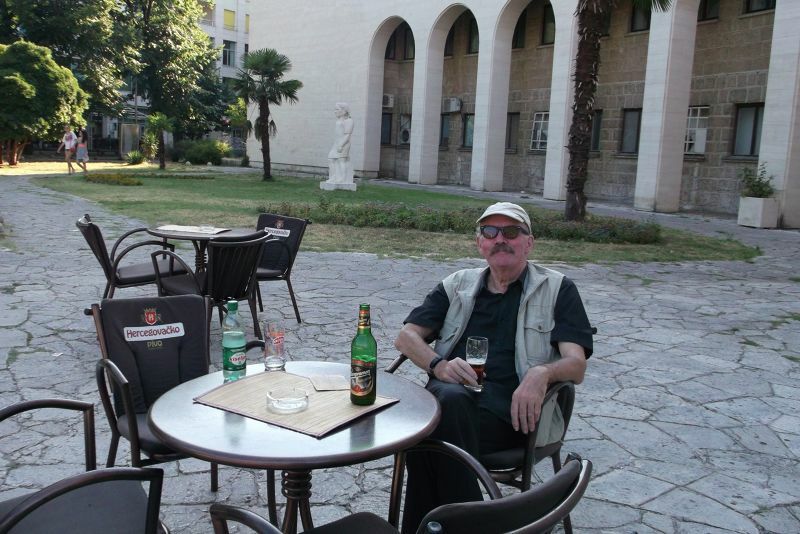 We had just part of an evening and two full days in Sarajevo. We decided not to do anything too strenuous as my husband is still recovering from a toe amputation and now has to walk with a stick. 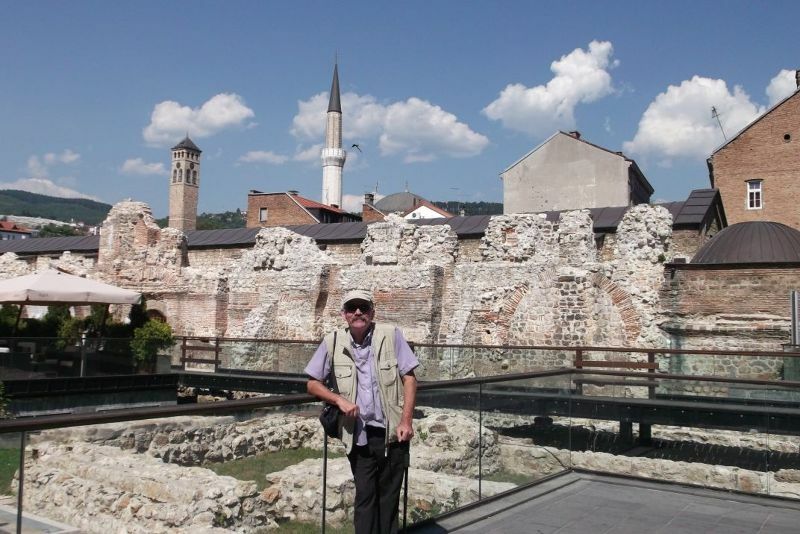 We explored the river, the yellow fort, the Turkish area and the Austro-Hungarian area. 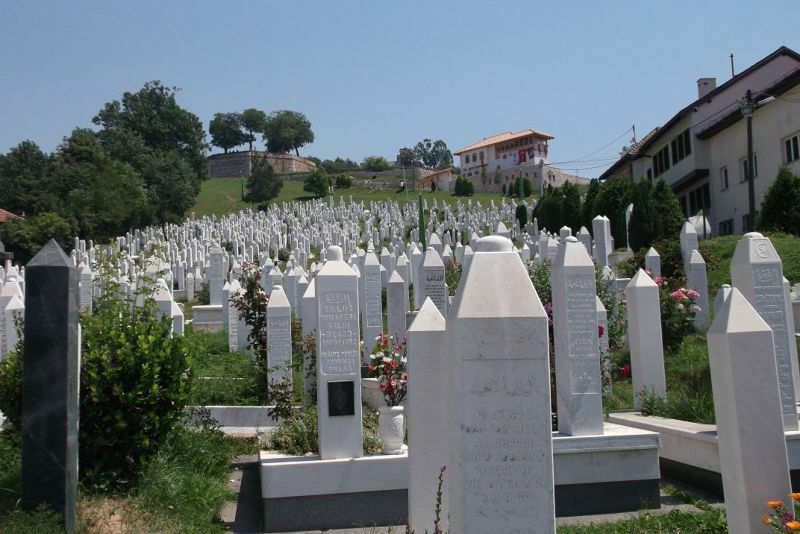 Bosnian people are very friendly despite having suffered a great deal. 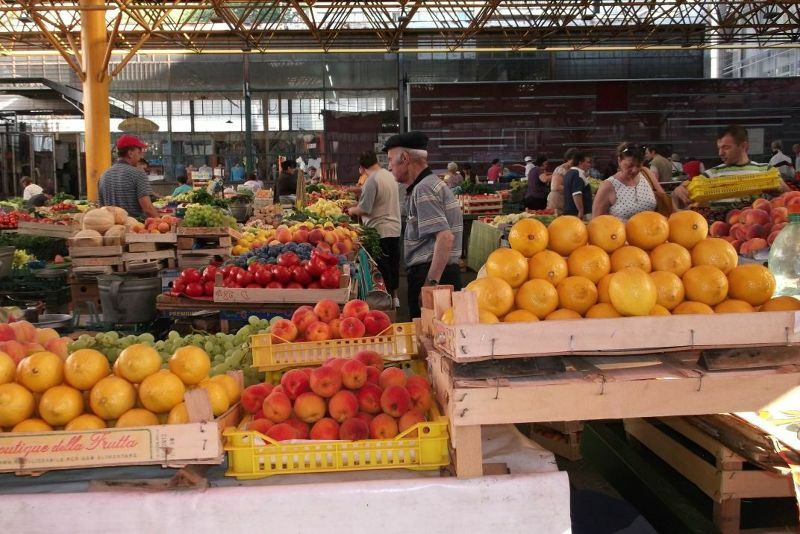 Food and drink are quite cheap and there are plenty of interesting things to see. We really enjoyed our stay. Pansion Stari Grad: Very Friendly Hotel. 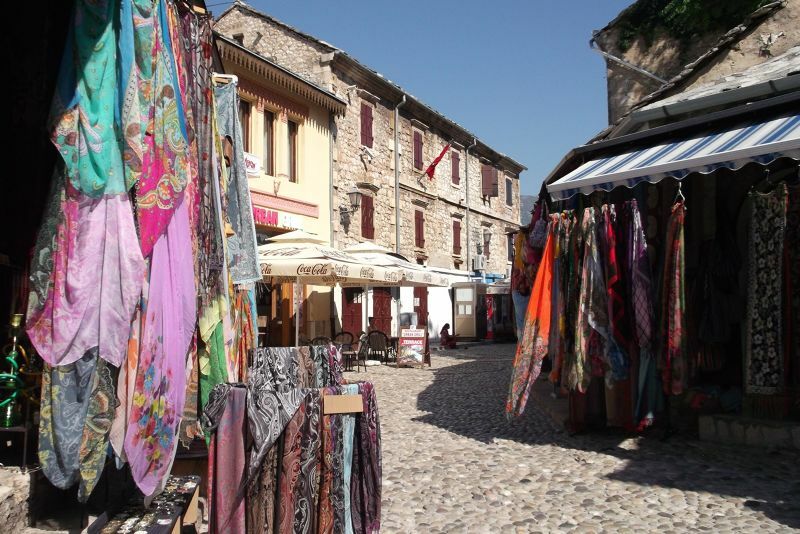 We stayed in the Pansion Stari Grad for three nights. We asked the hotel to provide us with airport pick up. 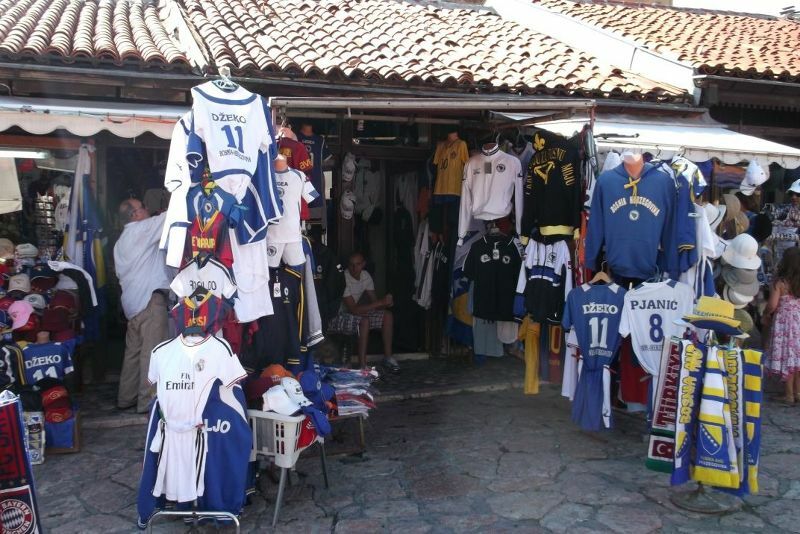 This cost 10 Euros. Our driver was there waiting for us when we arrived. 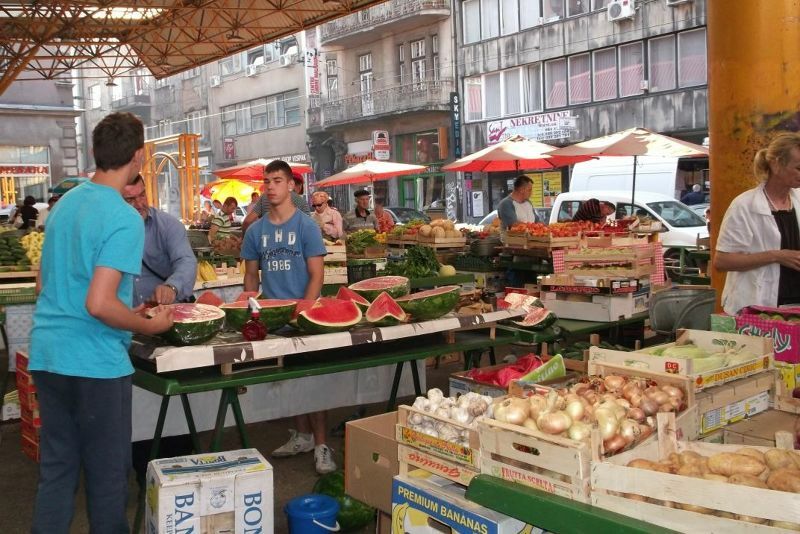 He was extremely pleasant, helpful, spoke excellent English and gave us lots of useful information about the town. 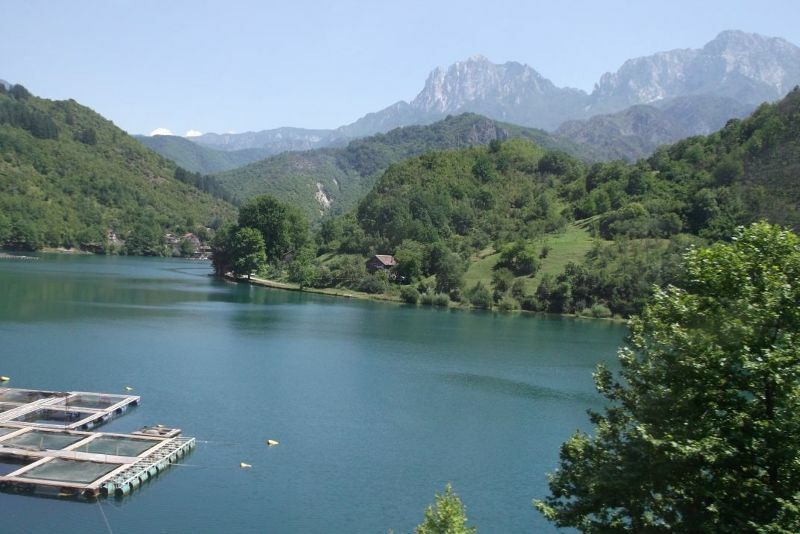 The pansion is in an excellent location - very close to the Bascarsija area. There is a Konsume supermarket nearby. There are lots of restaurants, shops and sights within walking distance. The pansion is also very close to a tram stop. Tram 3 goes to Ilidža, tram 1 to the train and bus station. All the staff at the pansion spoke good English and German. Everyone was extremely helpful and friendly. The pansion was spotlessly clean and beautifully decorated. Our room was very comfortable. Breakfast was provided each day. It included tea or coffee, juice, rolls, cold meat, cheese, cereal. You can either eat next to the buffet area or in the courtyard. The pansion was mainly quiet except on one night when other guests were noisy. The pansion is located on a side street so does not have traffic noise. There is no fridge, safe or coffee making facilities in the room. The beds are comfortable. There was plenty of hot water in the shower. I would strongly recommend this pansion for its lovely staff and perfect location and would happily stay here again. 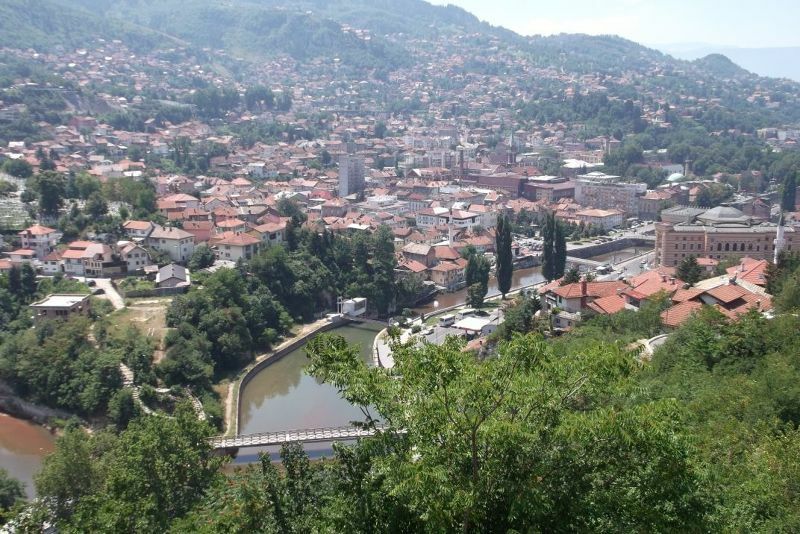 Address: Bijelina Cikma 4, Sarajevo, 71000, Bosnia and Herzegovina. 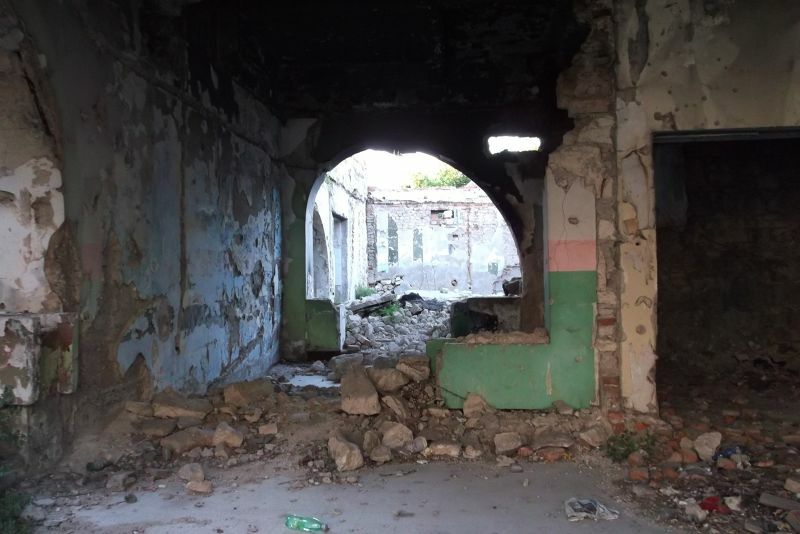 The Old Turkish Area: Bascarsija. 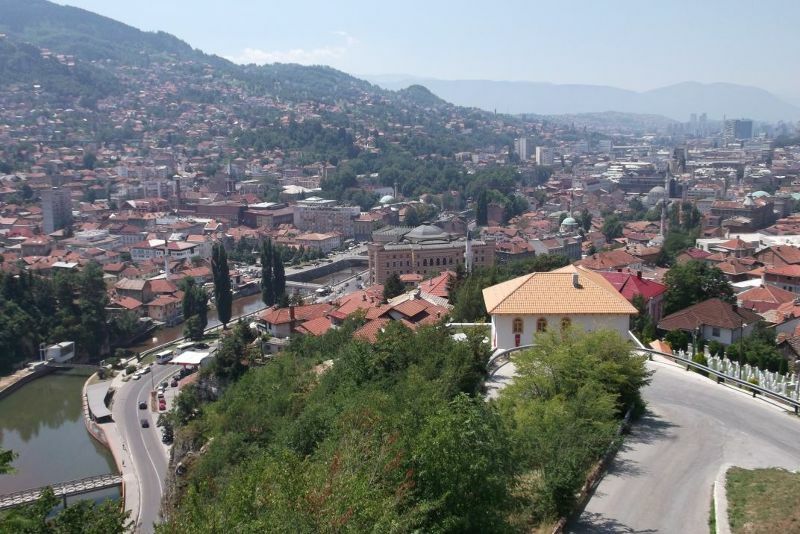 Baščaršija is the old Turkish area of Sarajevo. 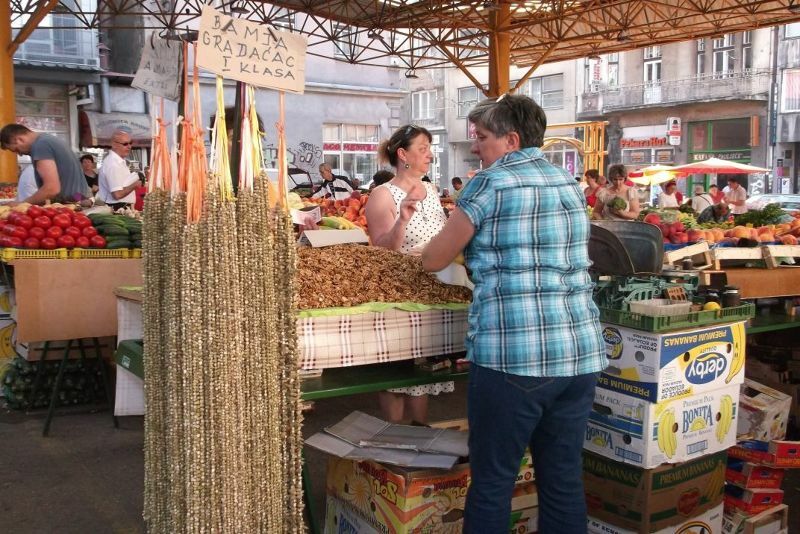 The name means main market. 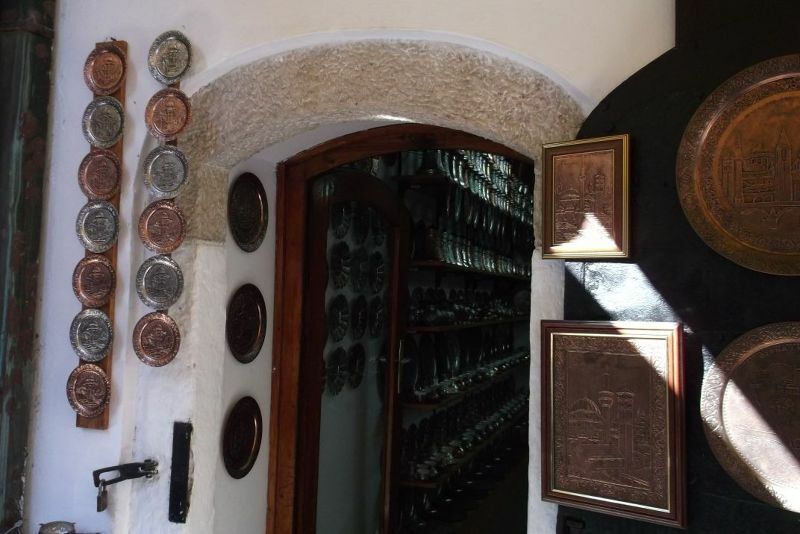 Baščaršija dates from the 16th century. 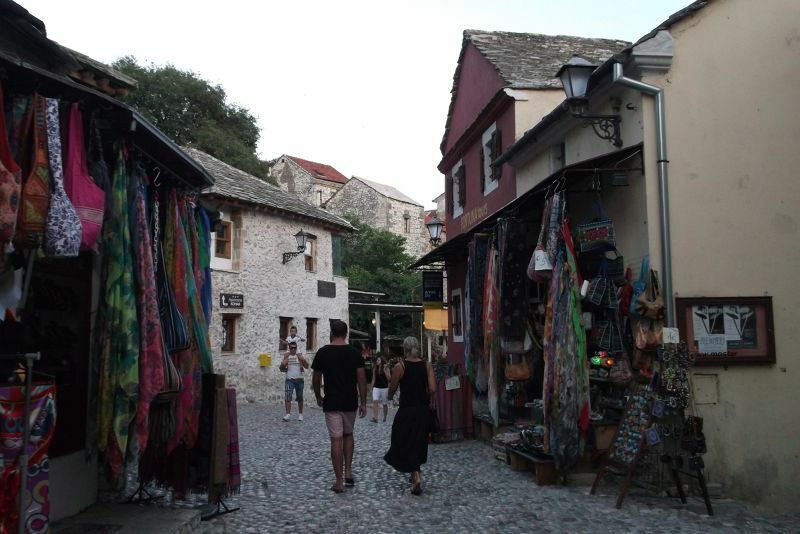 One of the oldest streets in Baščaršija is Kazandžiluk Street which means Coppersmith Street. 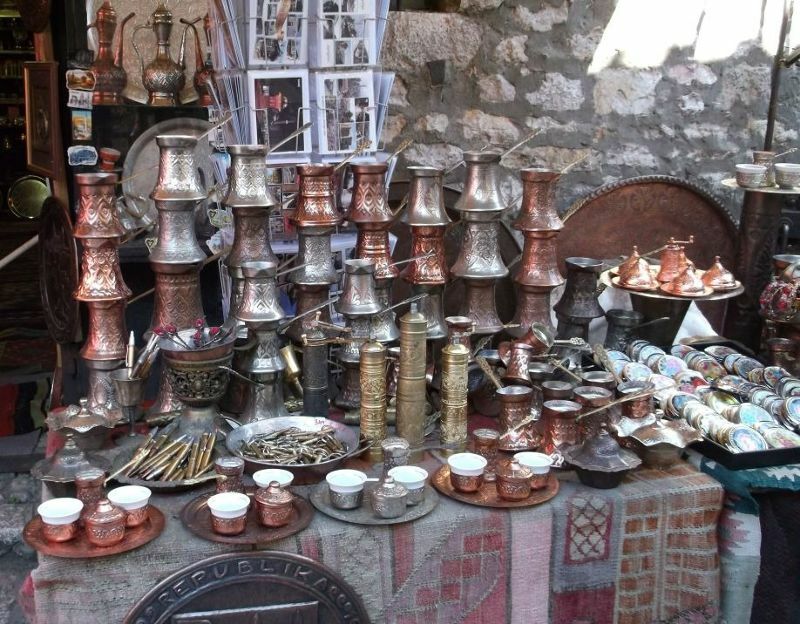 This street is lined with beautiful copper goods such as coffee pots and plates. There are many other interesting craft streets and stalls in this area. 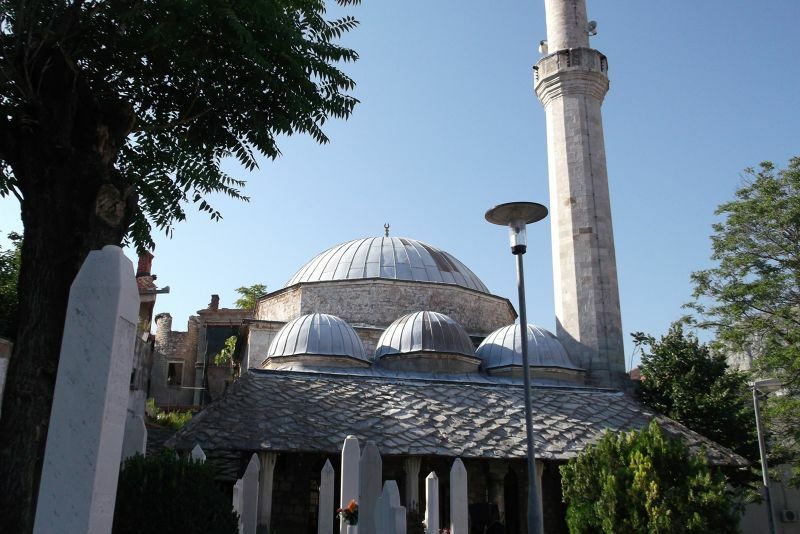 There are also several mosques, restaurants and a famous Ottoman fountain. 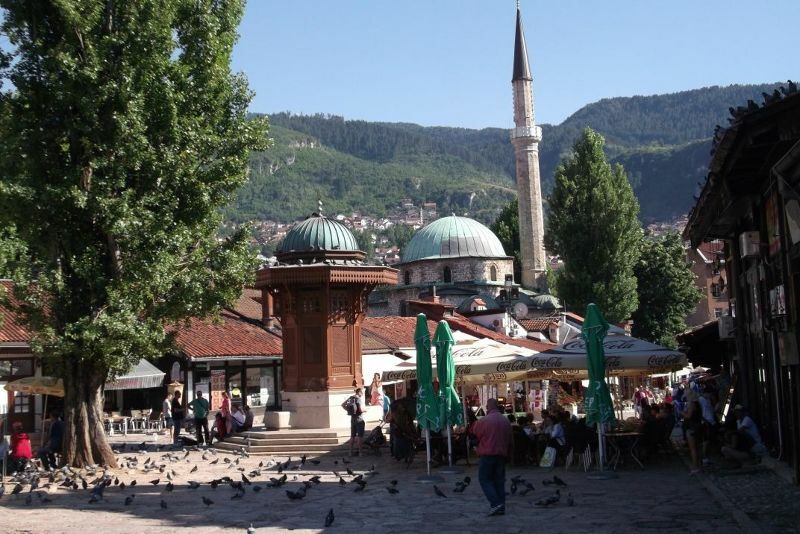 If you drink from the fountain you will return to Sarajevo some day. 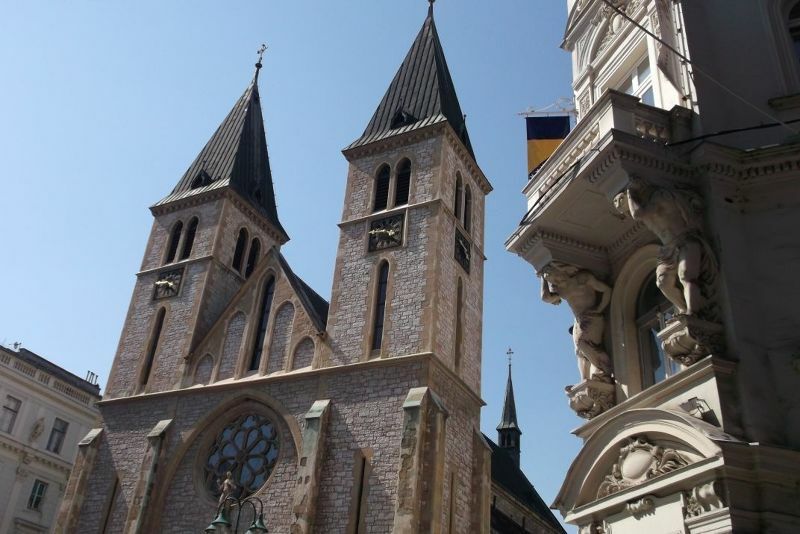 Sarajevo's cathedral is a very attractive building set on a pretty square with restaurants and a museum about Sebrinica. Unfortunately the cathedral was closed during our visit so we could not go inside. The cathedral is beautifully lit up at night. 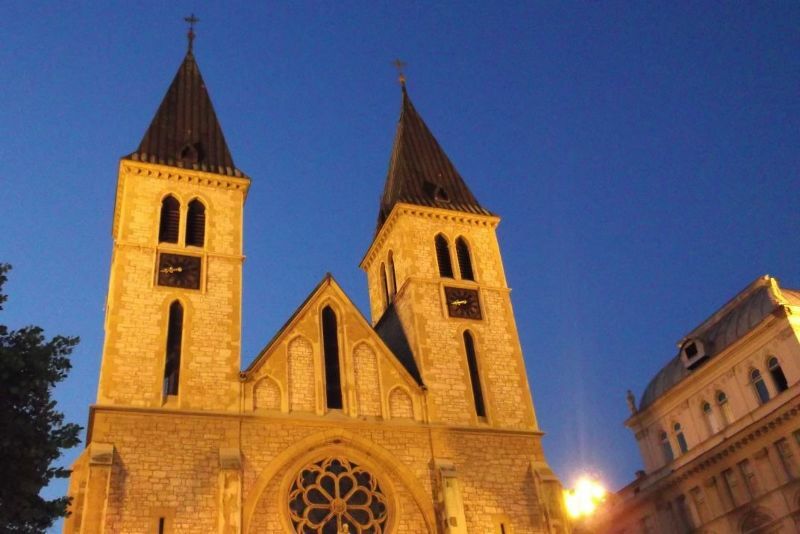 The cathedral is known as the Sacred Heart Cathedral and is modelled on Notre Dame Cathedral. This cathedral is set on a lovely little park with a sculpture representing peace and a huge chess set. Several people were crowded around enjoying a game when we visited. 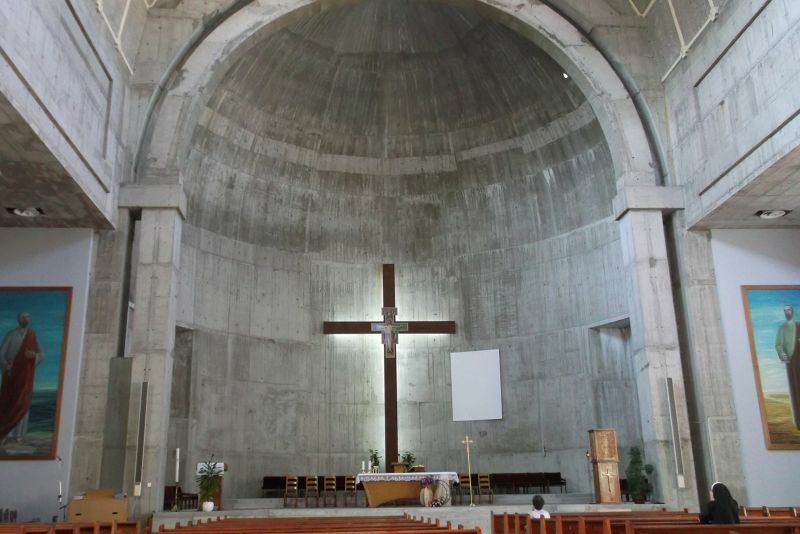 The church was damaged during the war. The church was built in 1869. The park also had a craft market during our visit. 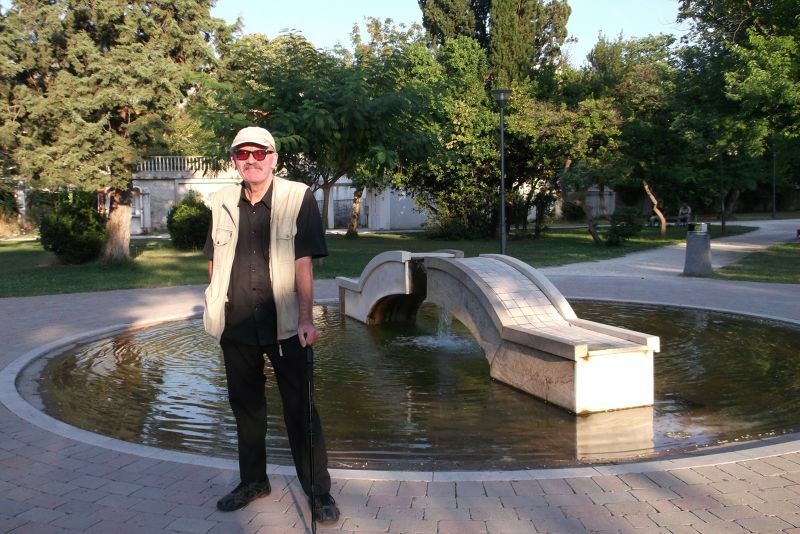 Park near the Serbian Orthodox Cathedral. 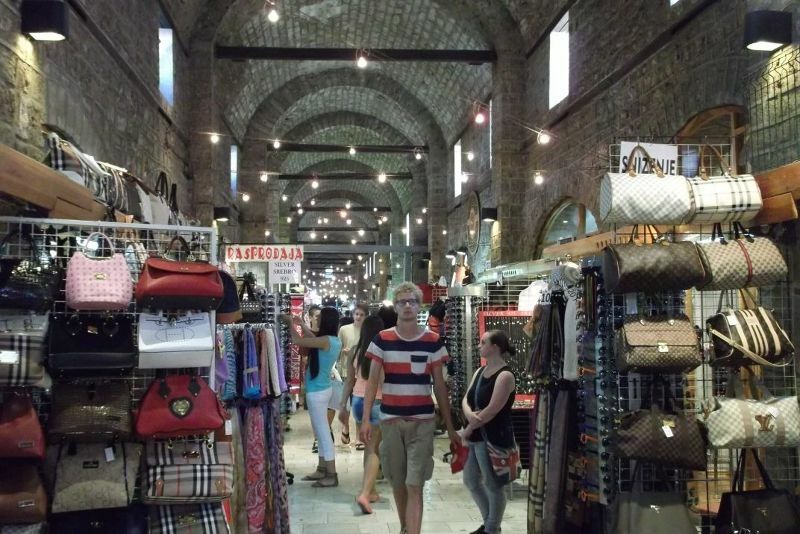 The Bezistan Saraci is an Ottoman covered market dating from 1555. There is a nice view over it from outside the Hotel Europe with the clock tower and minarets in the background. The Eternal Flame: Vjecna Vatra. 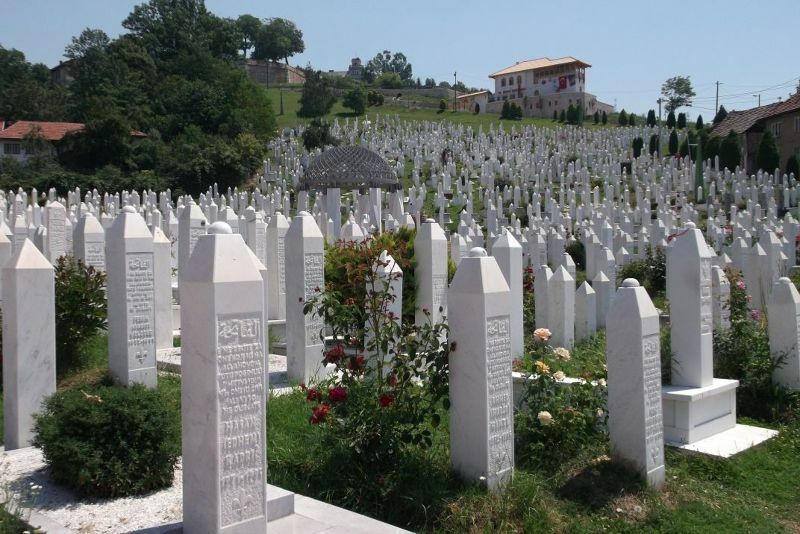 This is in memory of Bosnia's war dead from World War 11. 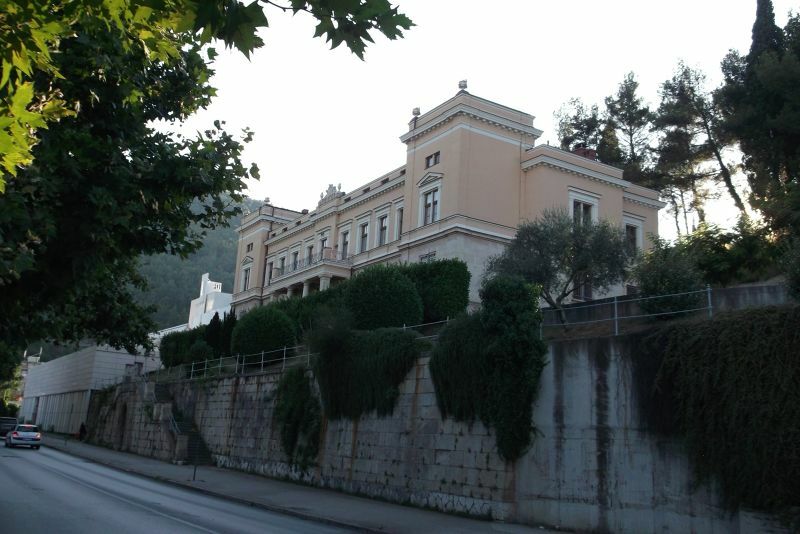 It can be found at the end of Ferhadija Street where it joins with Marshal Tito Street. 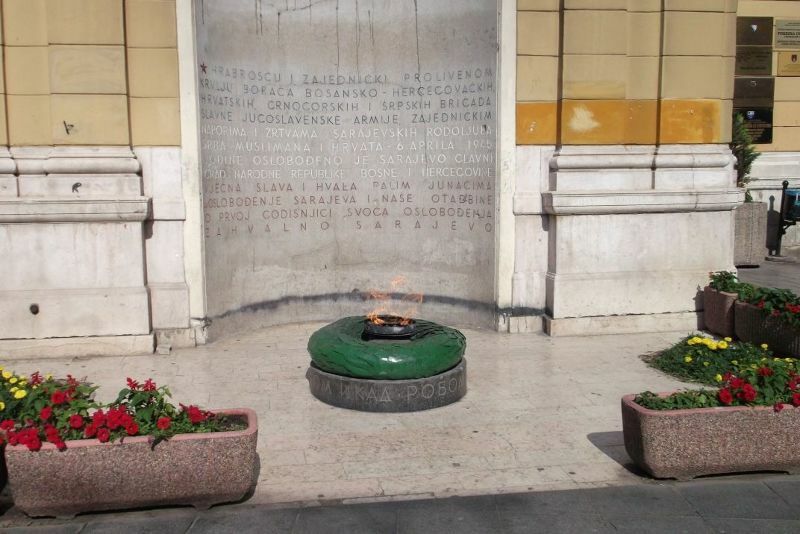 The eternal flame dates from 1946 and continued to burn throughout the siege of Sarajevo. We walked up to the Yellow Fort. 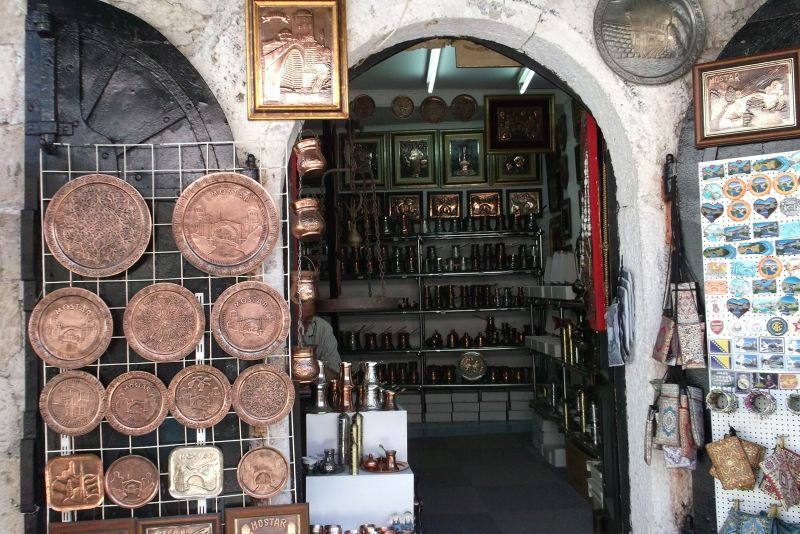 The route up passes some interesting shop fronts, then lots of cemeteries. It is a very steep climb. There is not much left of the fort itself just the broken outer walls. However, there is a great view from this location over the river and the old town. 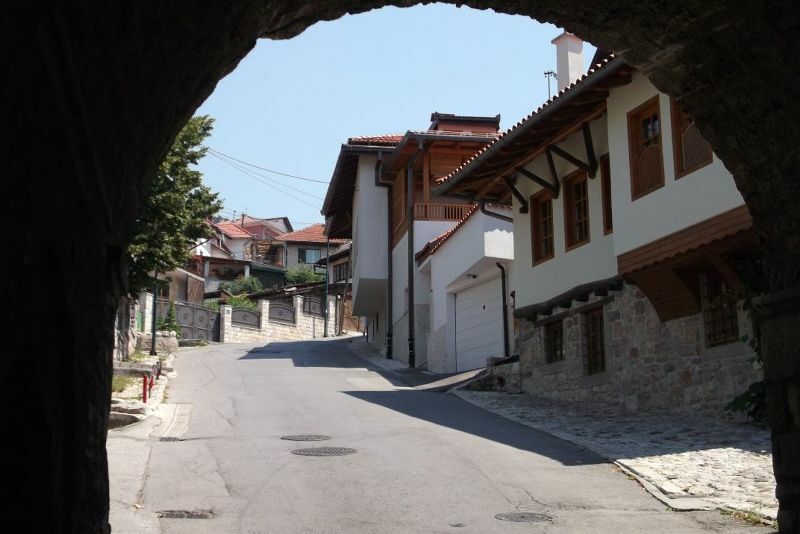 If you exit the fort and turn right instead of back down the steep slope, then follow this street to the end, then turn left, you will go down through one of the old city gates and then get back down to the bottom of the cemetery. The view is definitely worth going to see but because it is so steep climbing up before the heat of the day would be a good idea. From the Yellow Fort you look down onto a large cemetery sloping down the hill. 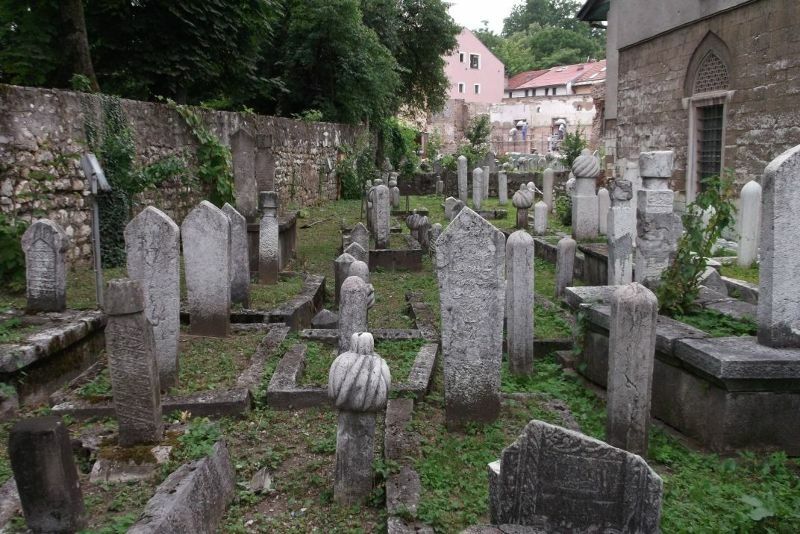 There are some older Ottoman style graves with turbans on top, but most of the graves date from the siege of Sarajevo. 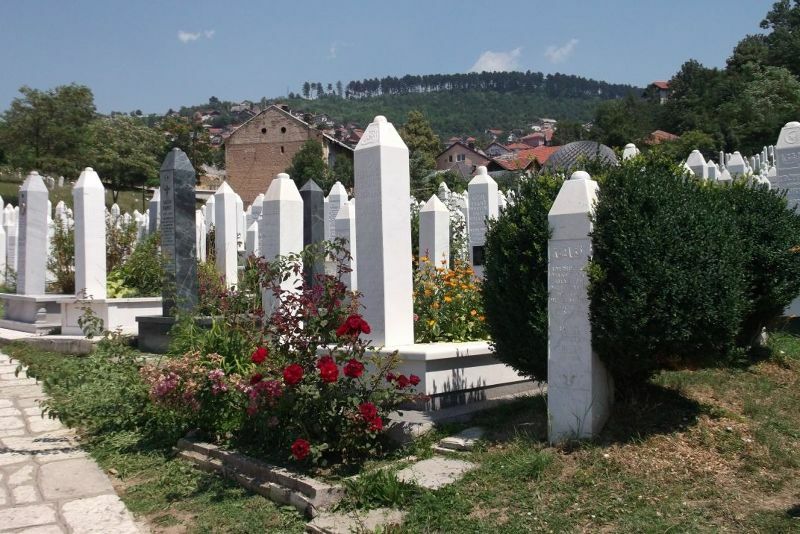 All the graves are well-tended white columns and many of them are covered in roses. 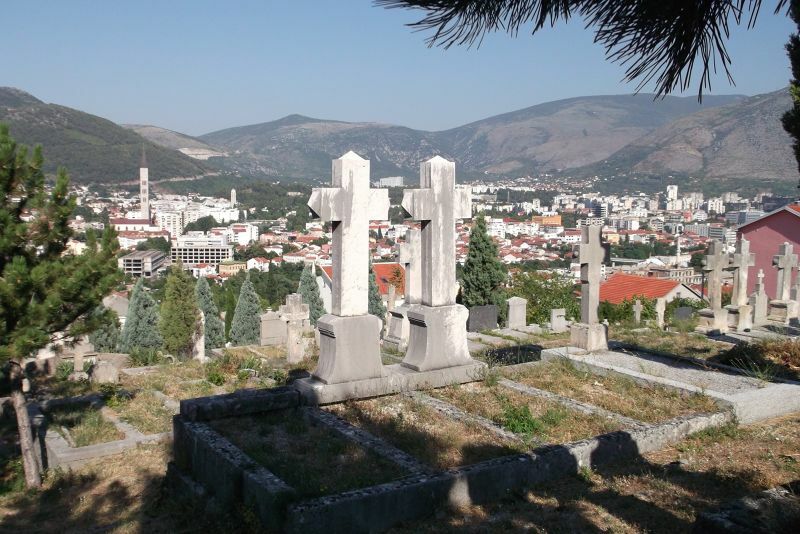 It is a beautiful and peaceful place but obviously comes from a terrible and tragic period of Sarajevo's history. 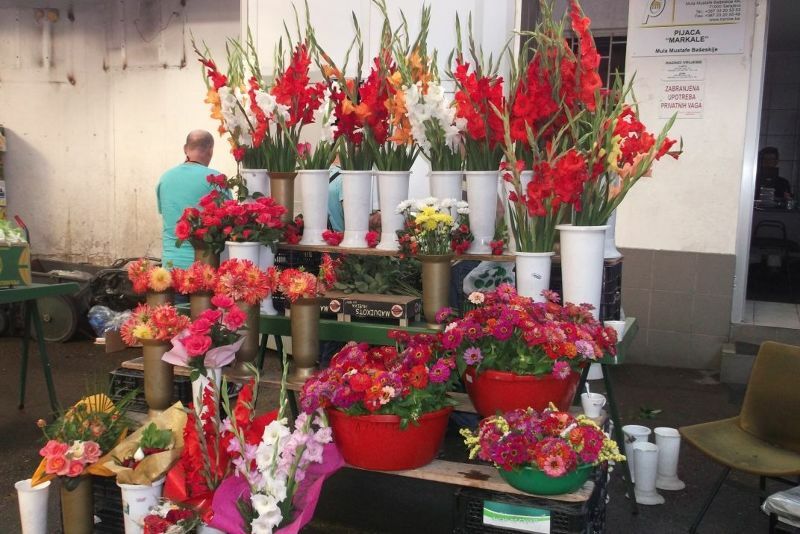 flower market. It is worth taking a stroll through. This little fellow was just adorable. I love cats and find them so photogenic that I have to take pictures of them everywhere I go. There are many of them it would be a joy to adopt, too. 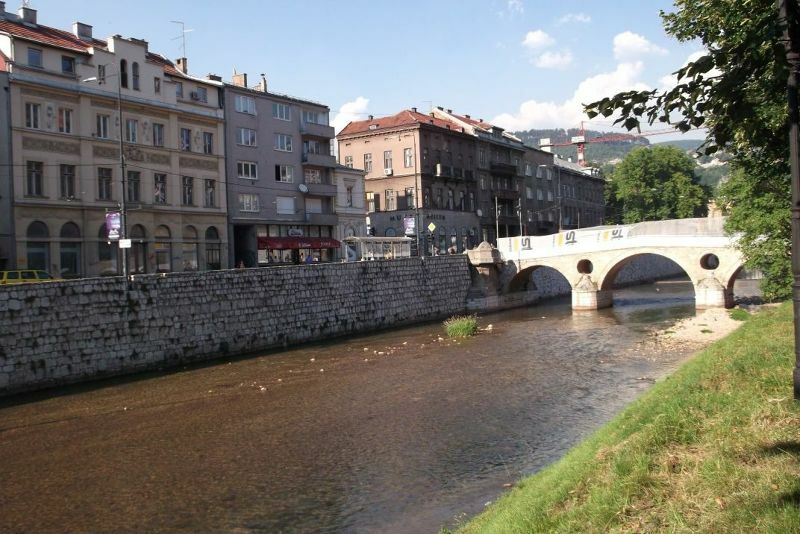 We took a long walk along the Miljacka River as many of Sarajevo's sights are located on or near its banks. 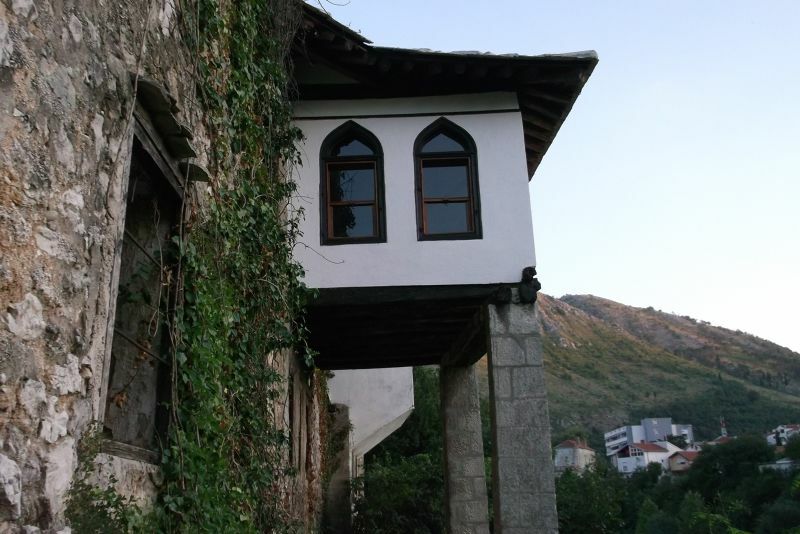 Along the river - House of Spite: Inat Kuca. location on the river is very pretty. 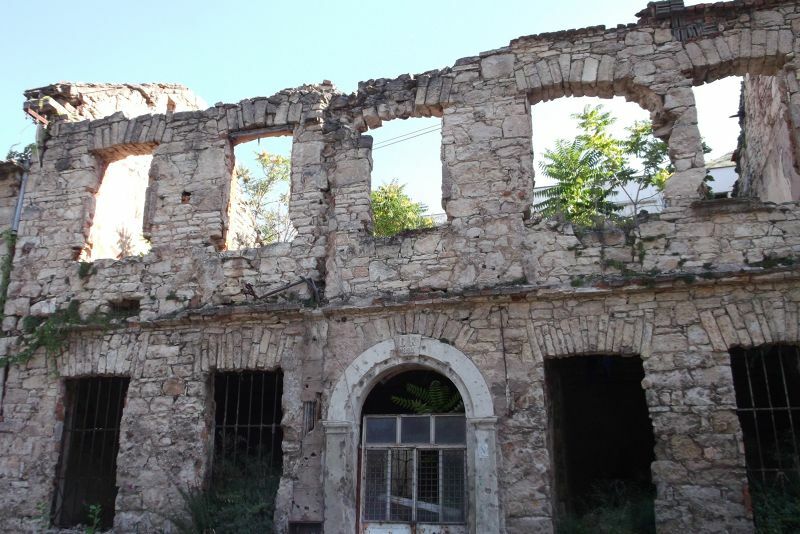 House of Spite: Inat Kuca. 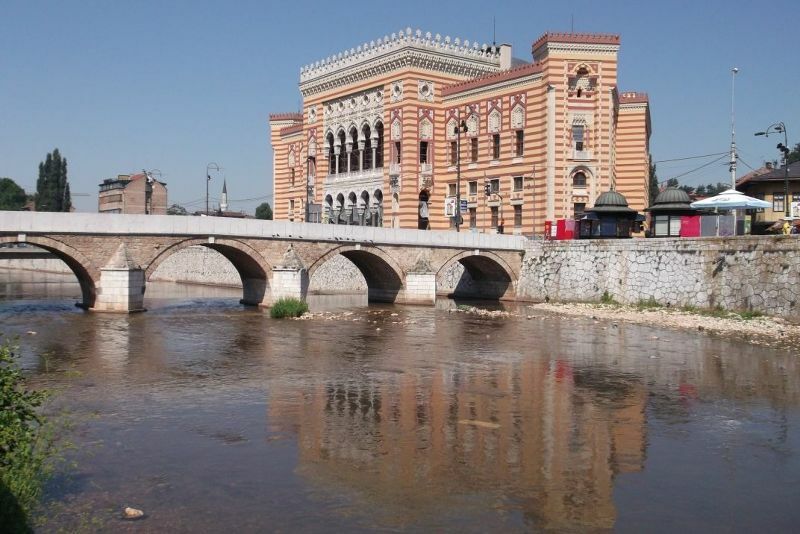 Along the river - Sarajevo: National Library. is currently sealed off and is still being restored. Along the river - Emperor's Mosque. 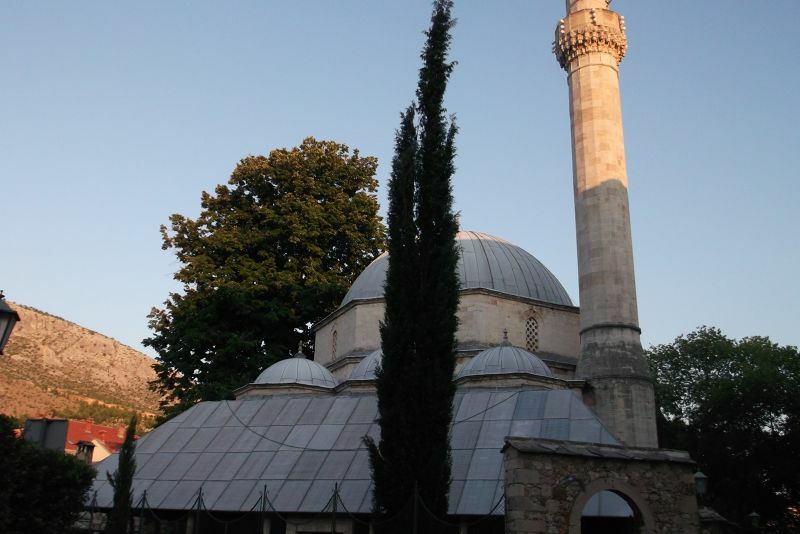 This beautiful mosque dates from 1565. It was built by Sultan Suleiman the Magnificent. 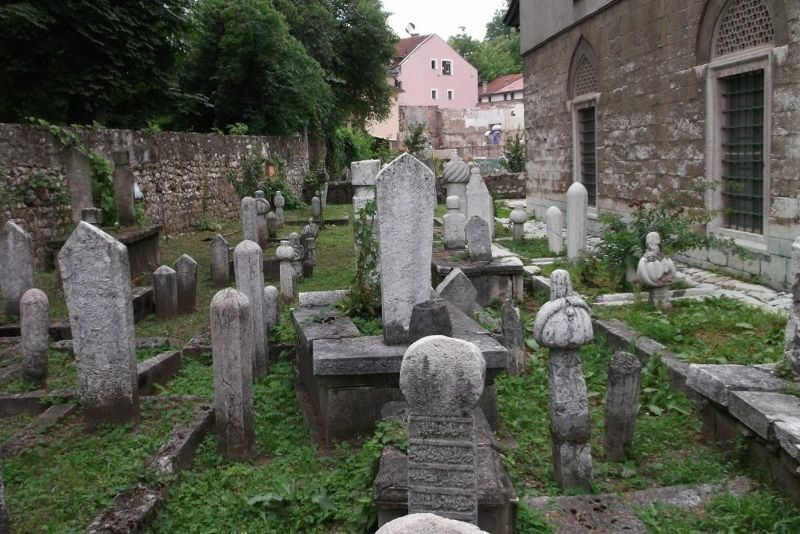 It has a lovely shady inner courtyard and there are many turban topped tombs in its cemetery. Along the river: General Post Office. The post office is located on the river right next to the university. It is an attractive building on the outside and it is well worth looking inside. 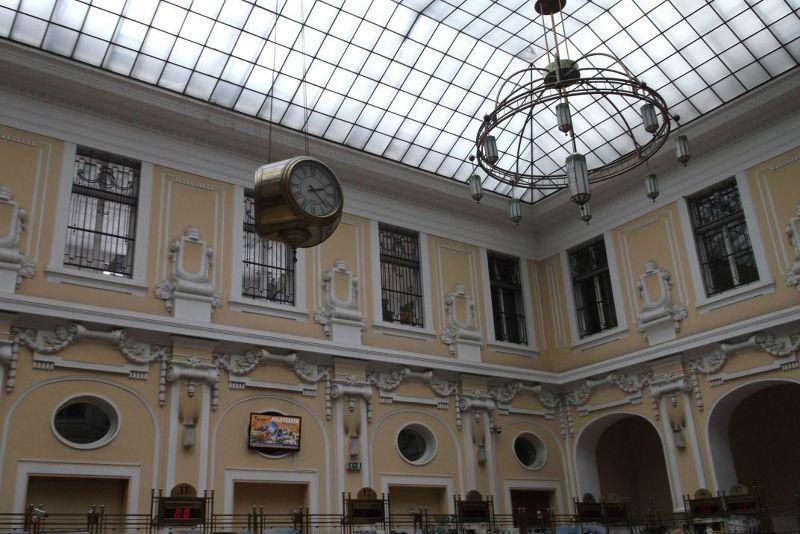 It has a lovely interior including a large brass clock. Along the river - Latin Bridge and Museum. The Latin Bridge was in a bit of a sorry state during our visit. The cobble stones across it were being relaid and the bridge was covered in tarpaulin and partially closed. From the state of the stones on the non-repaired side, I would have to say the repairs were essential. 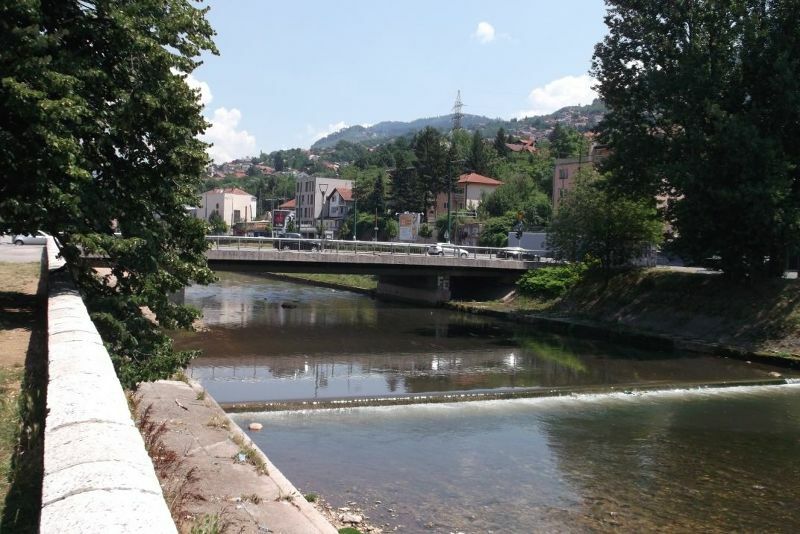 This bridge is, of course, famous as the place where Archduke Franz Ferdinand, heir to the Austrian throne, and his pregnant wife, Sophia, were assassinated by a Bosnian Serb nationalist called Gavrilo Princip on 28th June 1914. This assassination sparked off the First World War and thus changed the course of world history. 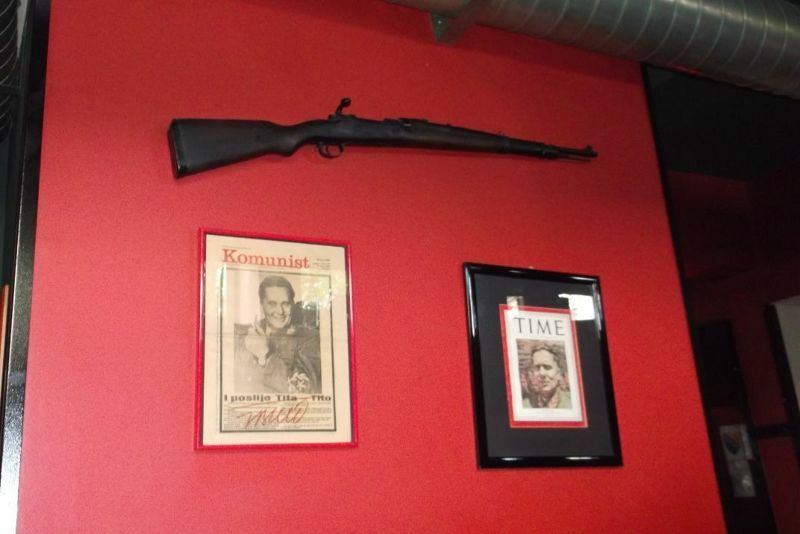 There is a little museum next to the bridge all about the assassination. 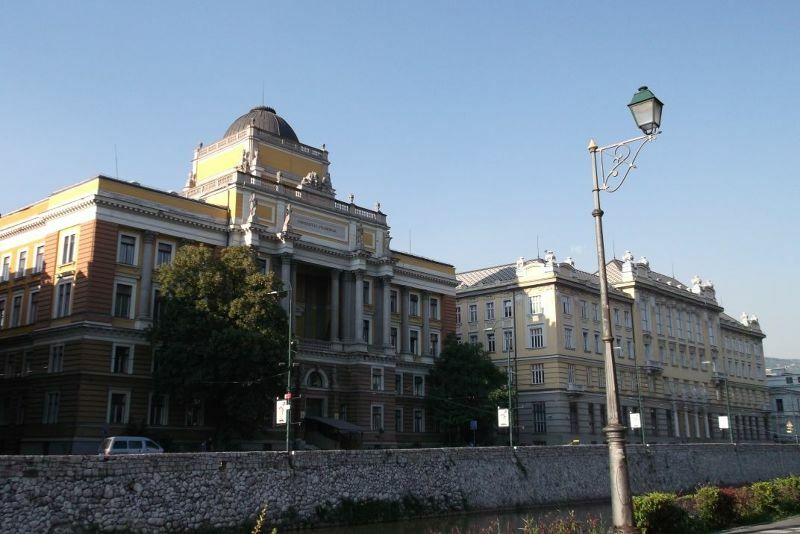 I did not visit, but had a look at the old photos of the archduke's visit, his subsequent funeral and Gavrilo Princip's court case which are displayed on the outside of the museum's windows. 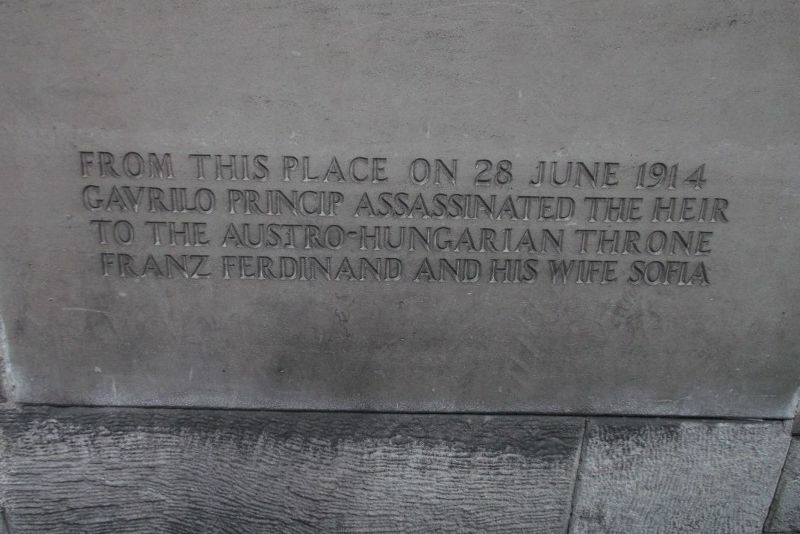 On the outer wall of the museum there is a plaque marking the site of the assassination. Along the river - Academy of Fine Art. This lovely building was once an evangelical church. We did not go inside just admired it from the outside. There is an interesting and unusual bridge in front of this building. 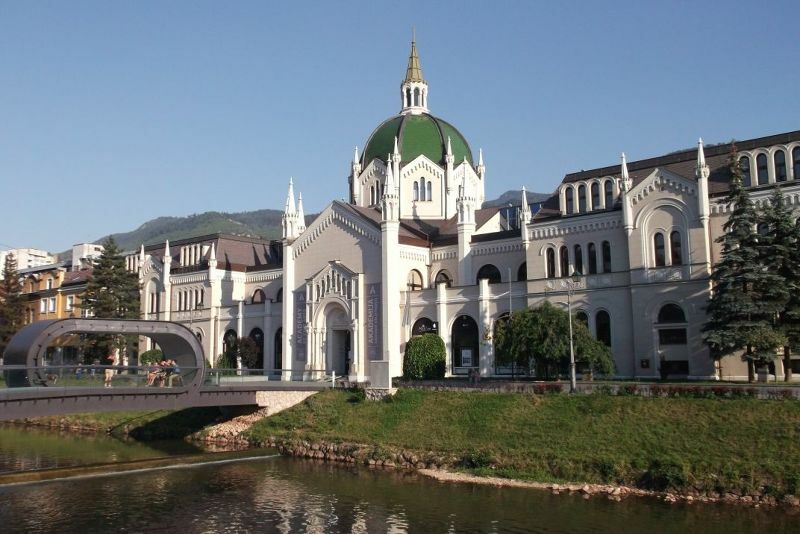 Along the river - The University. This attractive yellow building is located on the river next door to the post-office. We did not look inside, just admired it from the outside. Along the river - Romeo and Juliet Bridge. This bridge is really called the Vrbana Bridge. 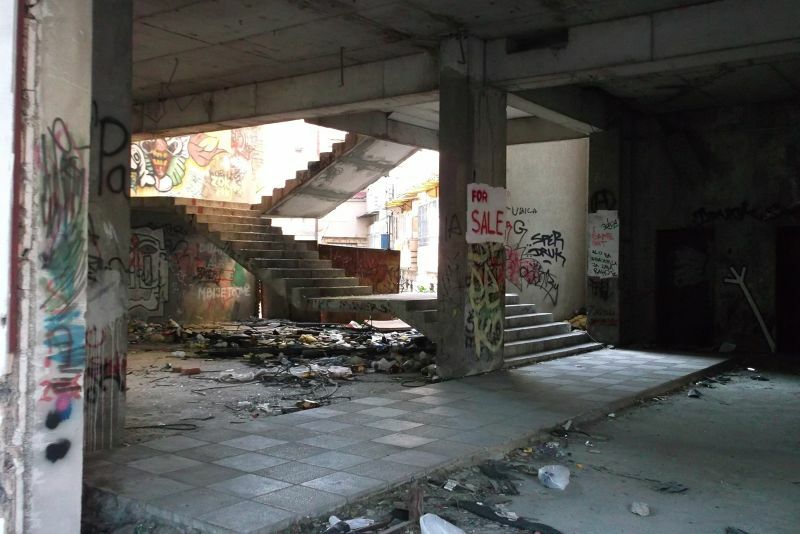 It does not look special, but during the Bosnian War in May 1993 two lovers, Bosko Brckic and Admira Ismi, were shot dead here as they tried to flee the besieged city. They had been sweethearts since high school. He was a Serb and she was a Moslem. The area was so dangerous no one could recover their bodies. They were shot at the same time. 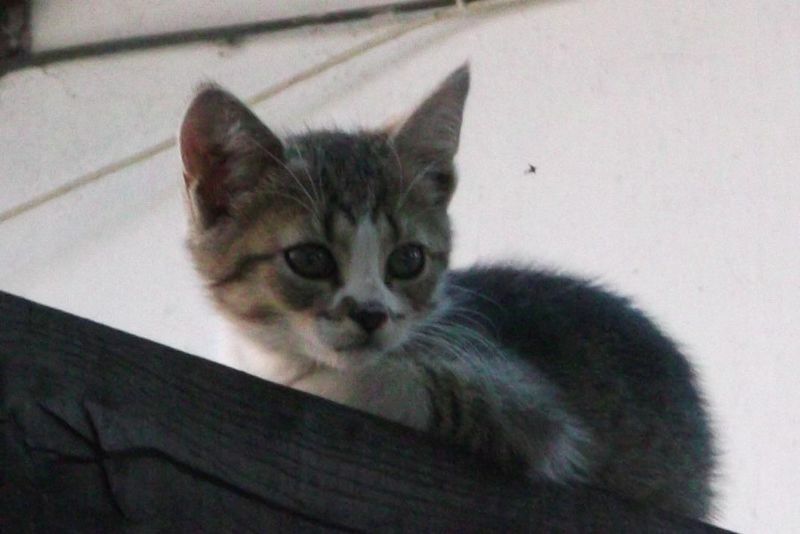 He died instantly; she crawled across and cuddled up to his body then she died, too. For days they lay in each other's arms. 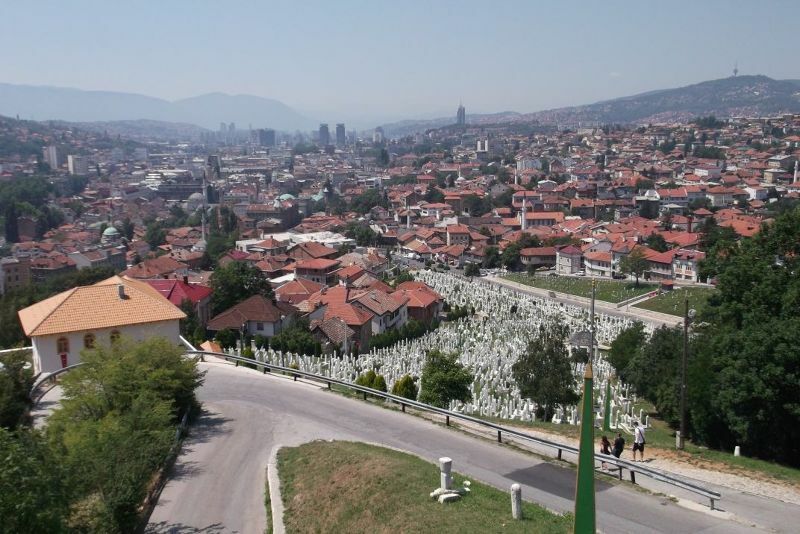 'Romeo and Juliet in Sarajevo' was an international documentary about their deaths. 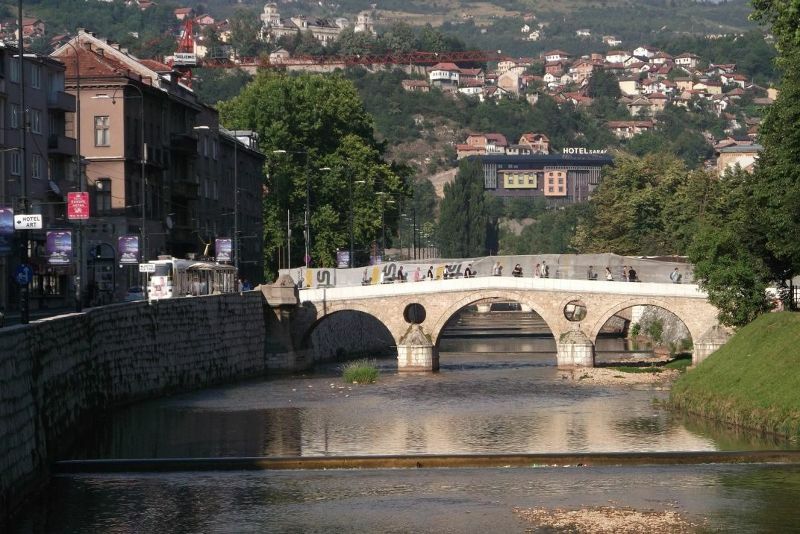 This bridge also saw the first casualties of the Bosnian War. Suada Dilberović was born in Dubrovnik to a Bosniak family. She came to Sarajevo t study medicine and was in her sixth year of study when the war in Bosnia started in the early days of April 1992. Olga Sučić (1958 – April 5, 1992) was a Croat. 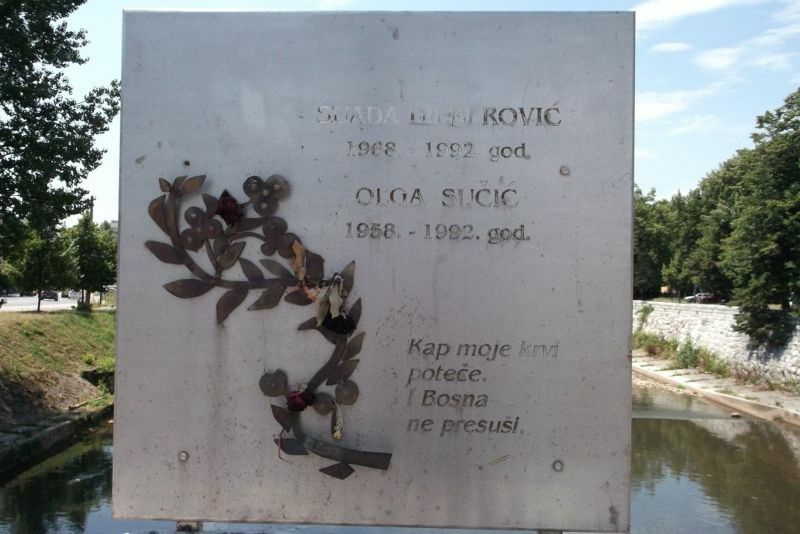 Both Suada Dilberović and Olga Sučić are considered to be the first casualties of the Bosnian War in Sarajevo when they were mown down on the Vrbana Bridge during a peaceful protest. There is a plaque in the middle of the bridge in memory of these tragic deaths. 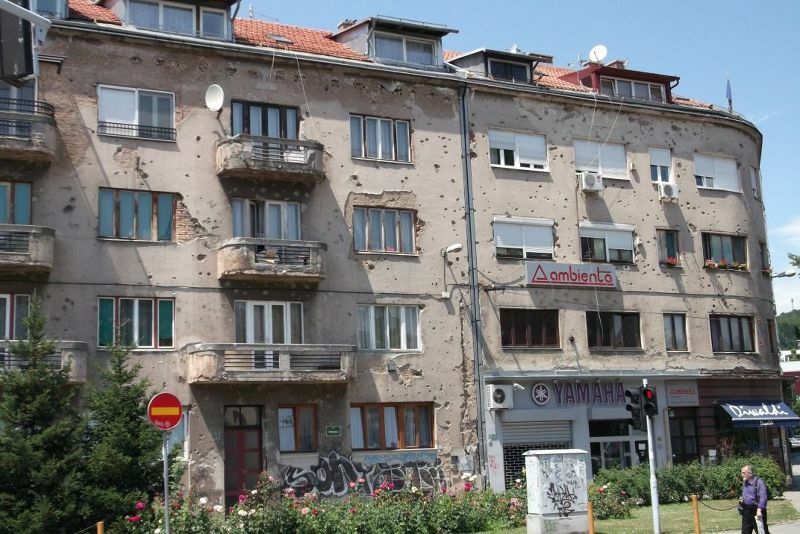 The buildings near the bridge are still riddled with bullet holes. Plaque on Romeo and Juliet Bridge. Along the river -Burned Out Houses. We walked back from the Romeo and Juliet Bridge to the Museum of Fine Arts through an area of bombed out burned down houses. 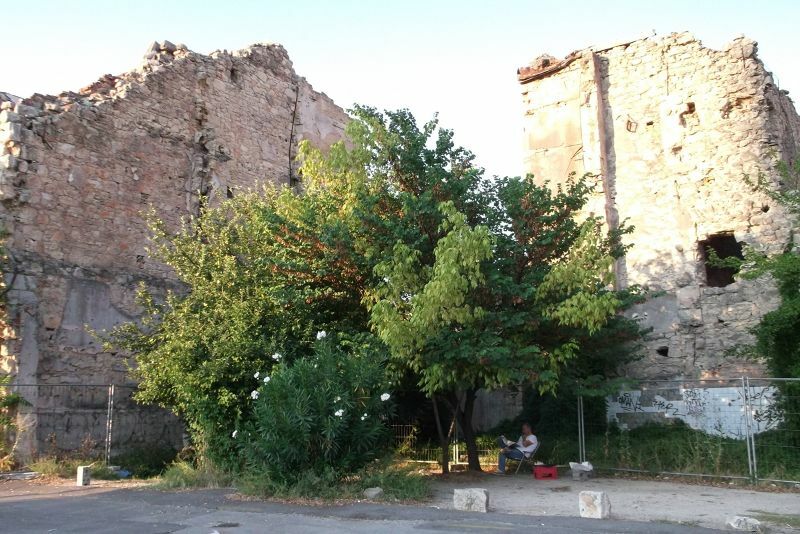 Some people were living in little houses among the ruins. Along the river - Brewery. 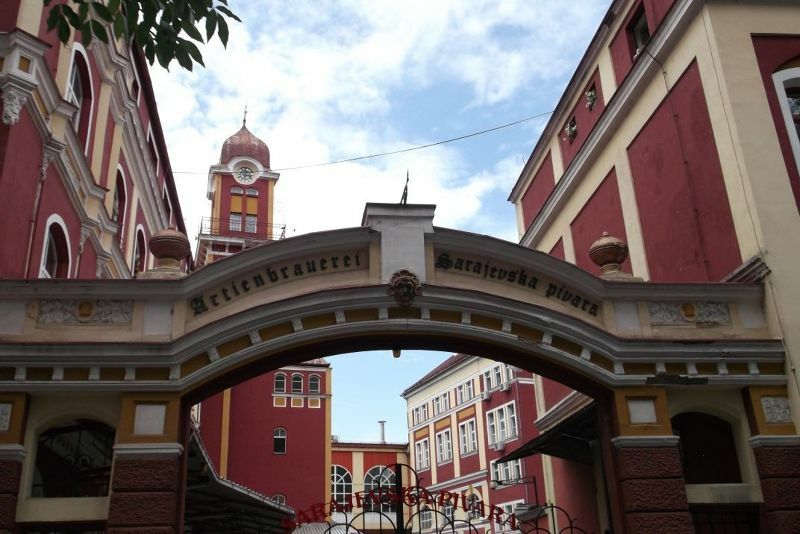 The brewery in Sarajevo is a beautiful colourful building and is well worth a visit. 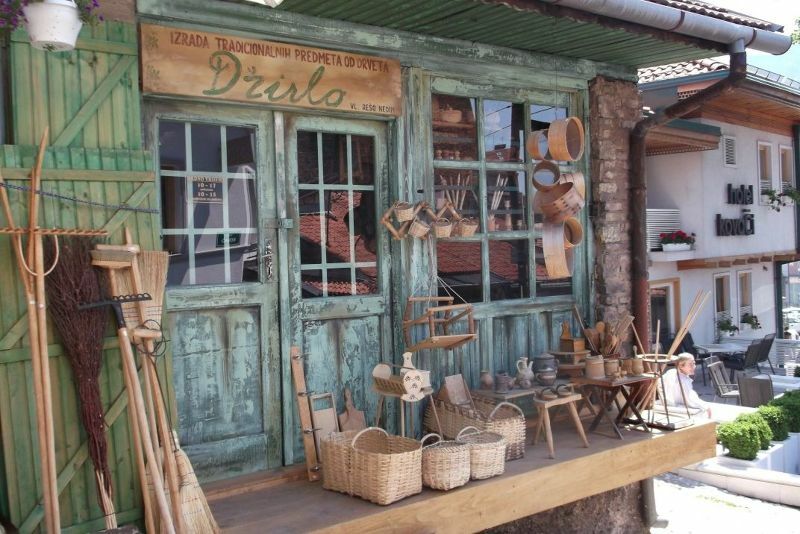 We had lunch here - Bosnian cold platter with two local cheeses and two local meats plus a basket of bread. 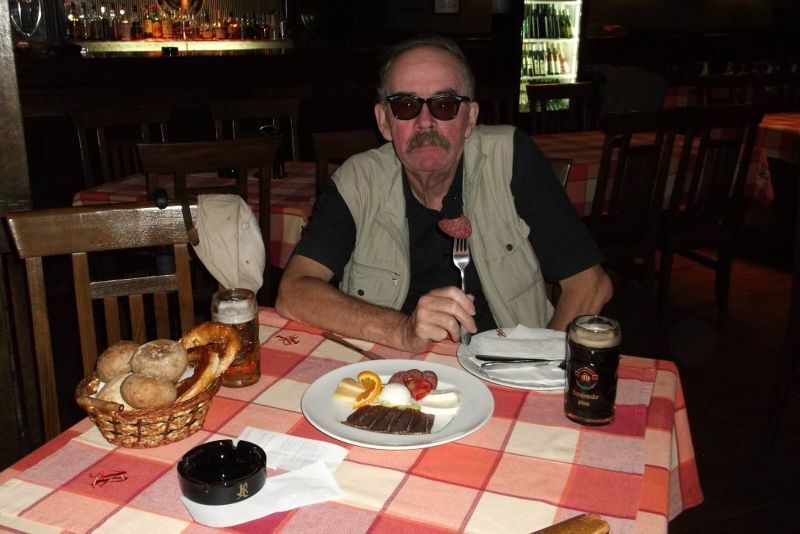 All washed down with ice cold Sarajvsko beer. The restaurant in the brewery looks like a theatre and is well worth a visit. Along the river - French Church. This building is near the brewery. It has lovely stain glass windows and some attractive paintings. Worth a visit. This is not a restaurant. It is a bar. It is directly behind the history museum. 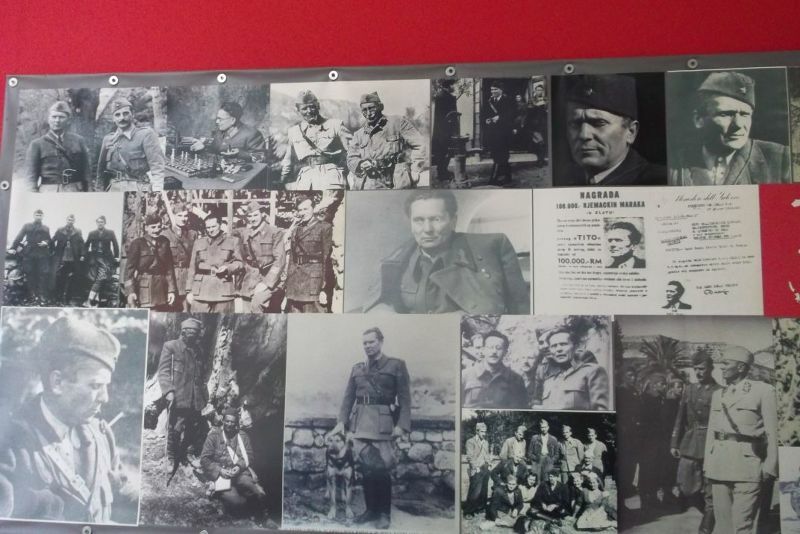 The walls are decorated with posters of Tito and there are guns and model aircraft decorating the ceilings and walls. 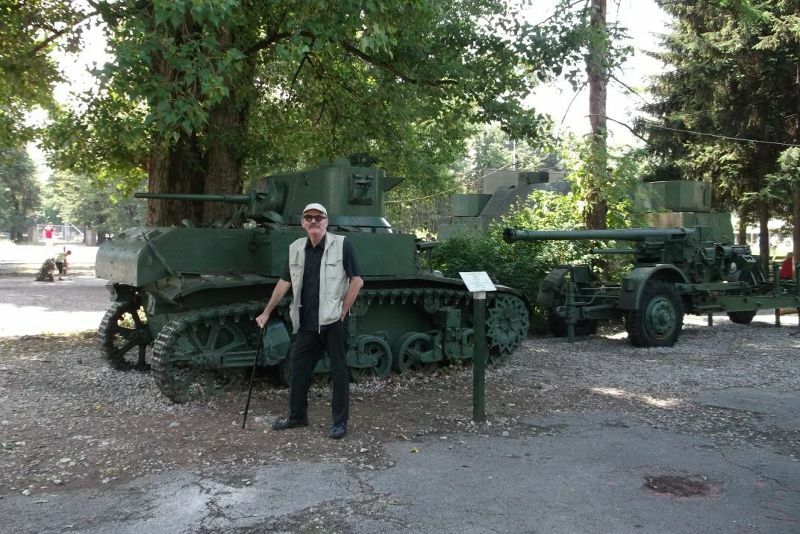 In the garden there are tanks and other old army vehicles. Children love to climb on them and play. There are shady areas to sit in in the garden. Very mellow, relaxed atmosphere. Clean toilet. We went here for beer and coffee. 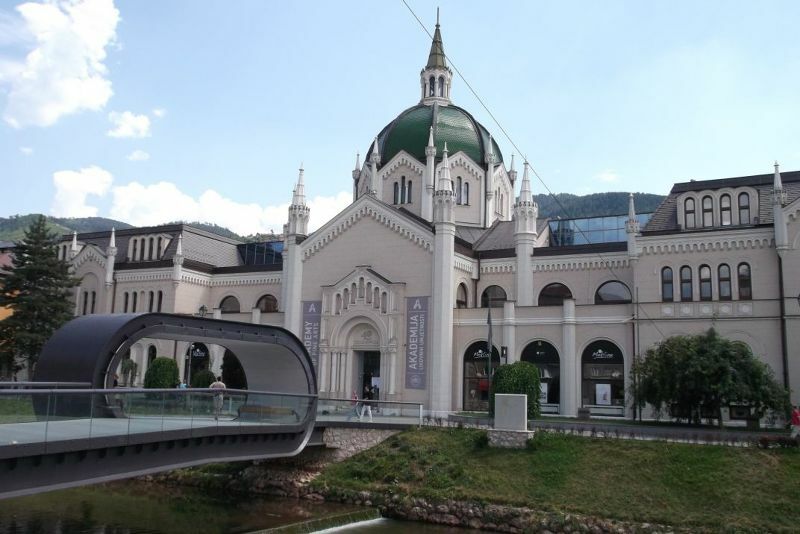 We mainly walked around Sarajevo but on a couple of occasions we used the tram. We bought our tickets from a kiosk for 1.60 KM (1.80 from the driver). When you get on the tram you must validate the ticket in the ticket machine. The machines are at each end of the tram. Failure to stamp the ticket will result in a fine. Throw away used tickets. When we were ticket inspected, we accidentally handed over old ones, then other old ones, before finally finding the new ones. They were quite pleasant about it. 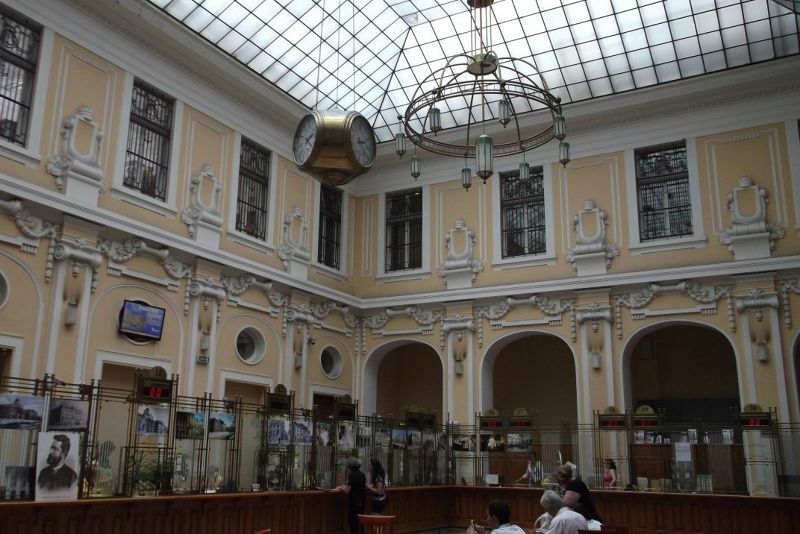 If it had been the ticket inspecor we encountered in Sofia, we'd still be in jail. Tram 1 goes Bašèaršija to the train station and bus station. Tram 3 Bašèaršija to Ilidza. 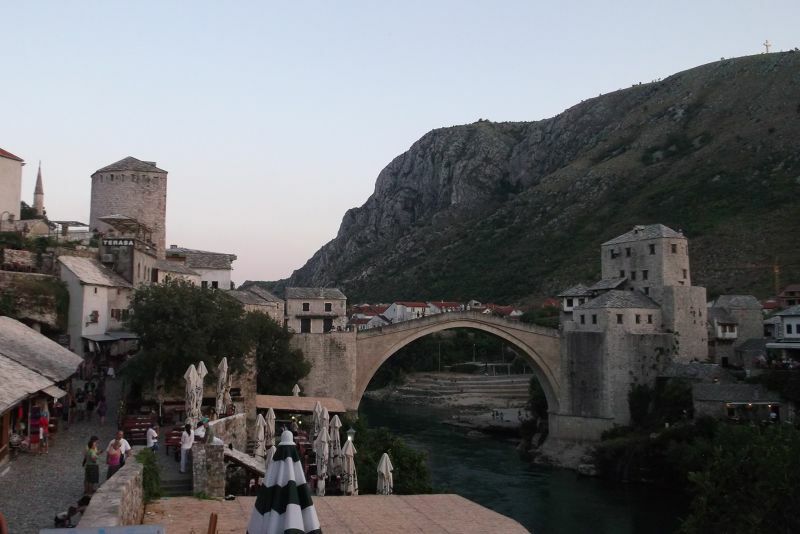 We defied all the advice and took a bus rather than a train from Sarajevo to Mostar. Everyone says the train journey is great. We choose the bus as there are many a day and we could leave at a more convenient time. We went at 11.30am. The bus was comfortable. At one point people picked up from later stops outside Sarajevo had to stand, but it turned out they were not travelling far. The bus was air-conditioned. The scenery was great. The ticket cost 20KM (10 Euros). The journey took 2 and a half hours.